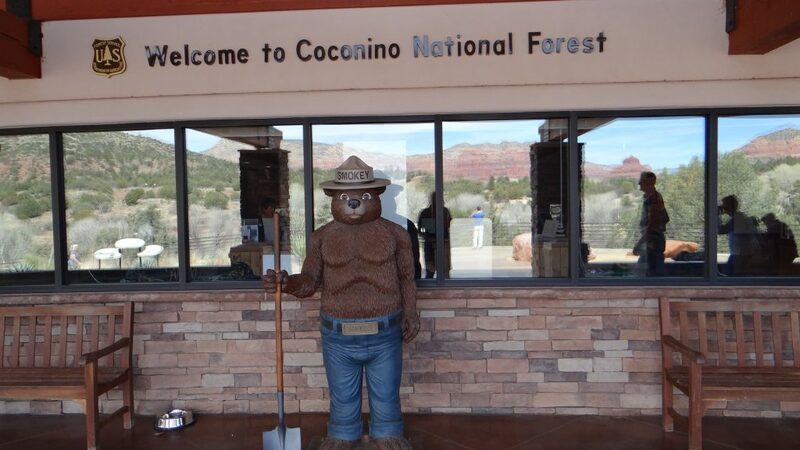 1,359 miles and 24 days later we reach San Diego, California and finish our journey West, and prepare to go North. 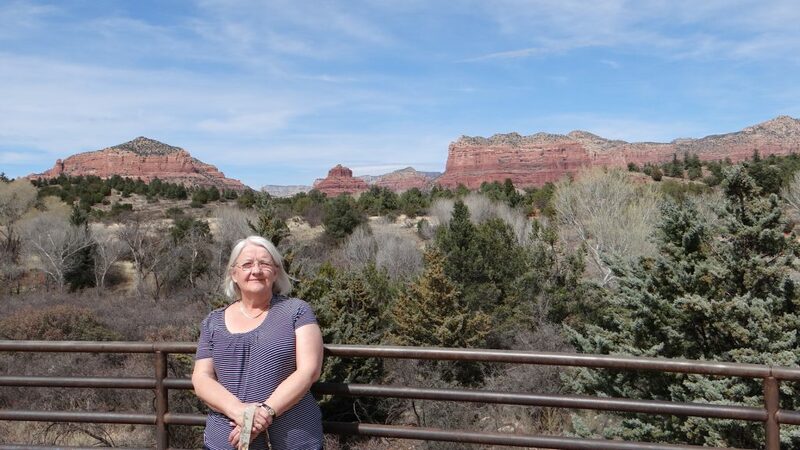 It seems ages ago since we left Dallas, but we have had a very interesting trip across 4 States (Texas, New Mexico, Arizona and finally California) and two time zones. 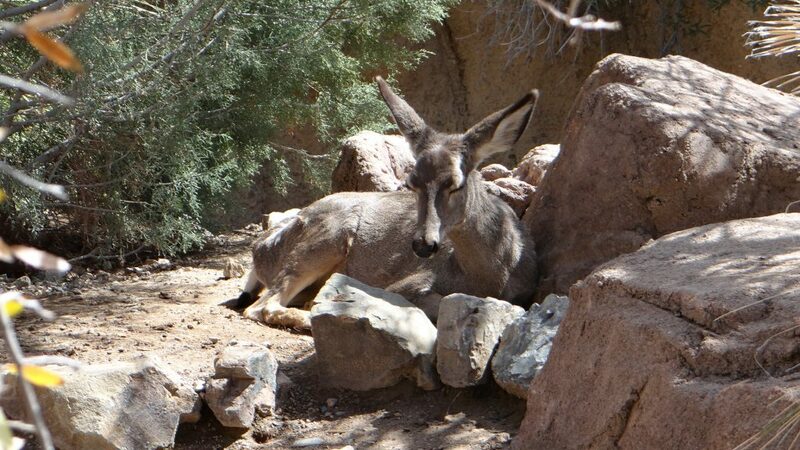 At the end of my last post we had just arrived in El Paso. 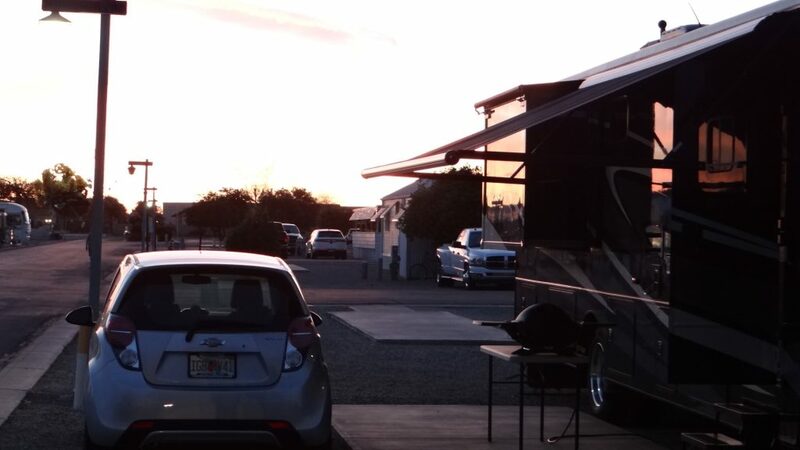 We were staying in El Paso West RV Park, which as the name suggests was on the western edge of El Paso, a city that was a place of contrasts. 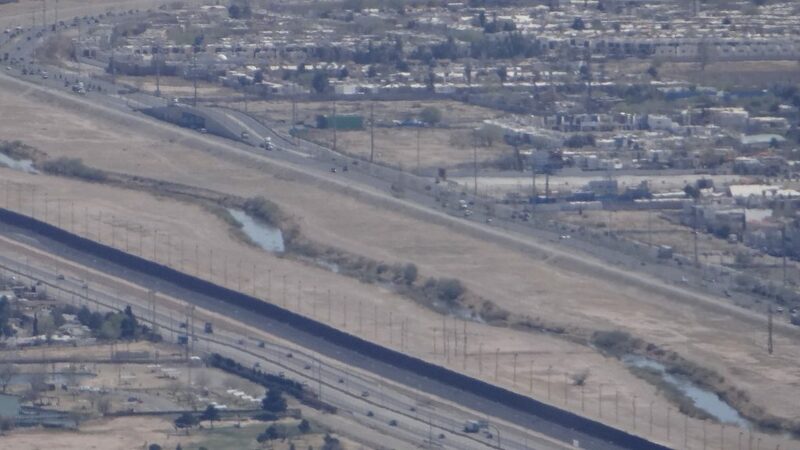 It sits on the side of the US border with Mexico and as you pass through it you can see American affluence on one side and Mexican poverty on the other. No wonder the Mexicans are always trying to get across the border when all they can see from what looks like shanty towns is the much greener grass on the other side. We saw the first signs of the famed “wall” although this is the existing one and not the Donald Trump promised one. Our first trip out was to the Wyler Aerial Tramway, a Swiss made cable car that whisks you over 1,000ft up in 4 minutes, along a 2,600ft cable from the bottom station to the top station sat at 5,632ft on Ranger Station. 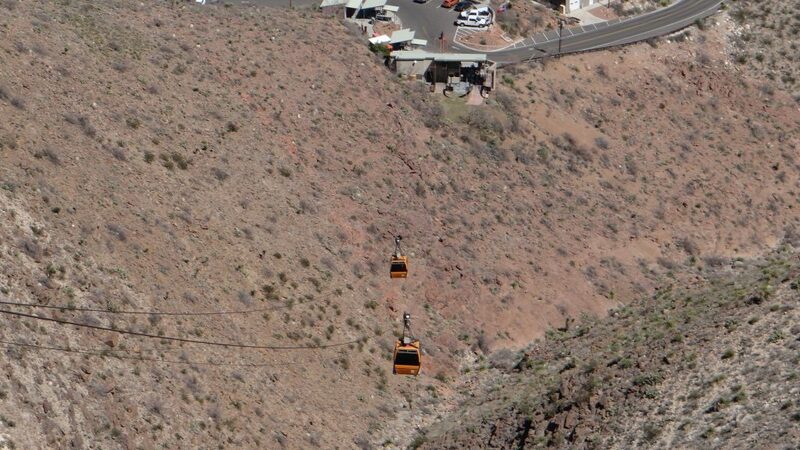 View from the top down to the bottom gondola station. 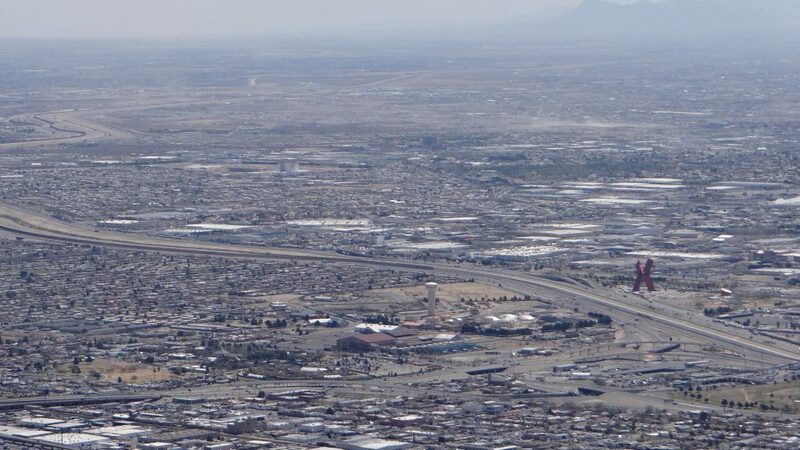 From the top is panoramic view of El Paso, Mexico, and the huge US Army training area of Fort Bliss where all the US troops going to Afghanistan are trained and then flown out. 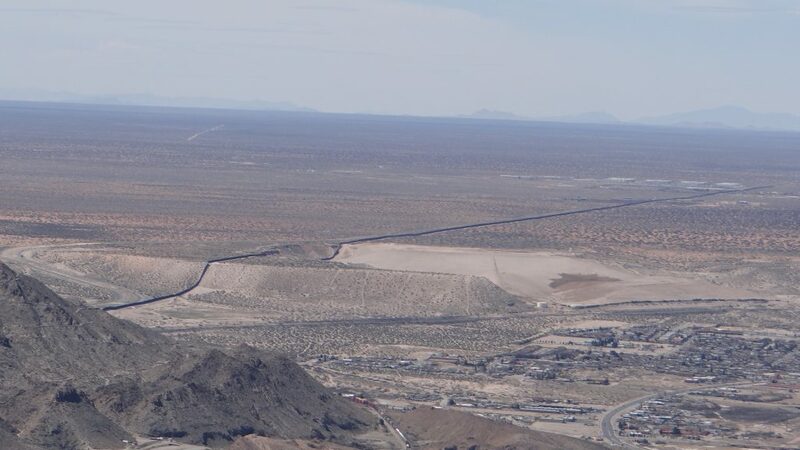 From here you can see the Rio Grande, the US/Mexico border crossing point and parts of the “wall”. X marks the border crossing point, the Rio Grande (the small river) snakes away to the left and the “wall” can be seen on the US side of the border. 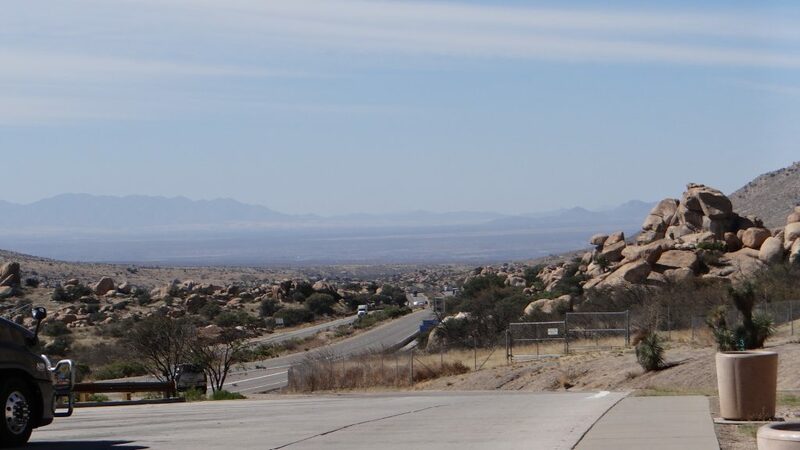 The “wall” heading out towards Las Cruces. A better picture of the Rio Grande and the “wall”. 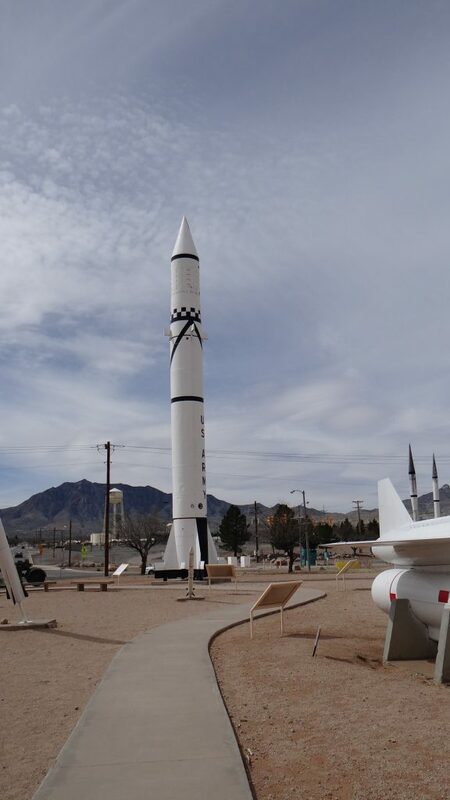 The following day we visited the White Sands Missile Range Museum and the White Sands National Monument. When we showed up at the front gate of the former we thought it was closed. But it turned out that you had to have your passport and identity checked and then you could walk into the Museum which was about 200yds inside the base perimeter. I think US citizens could drive in but us Brits had to walk. 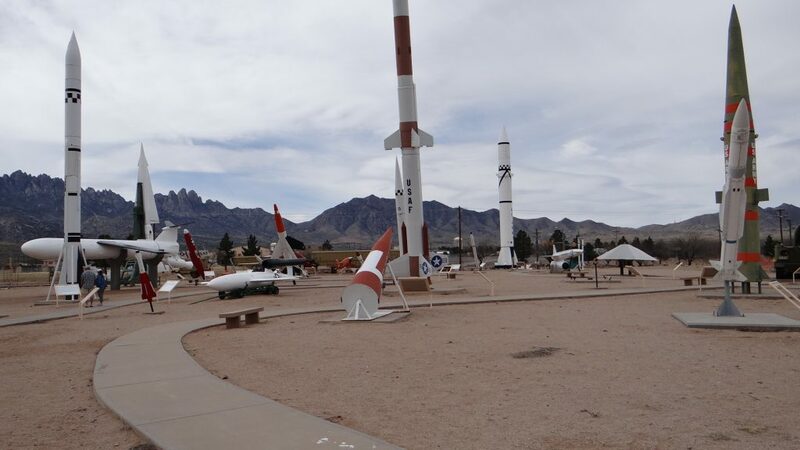 Inside was a museum that plotted the course of US Missile technology from the V2s brought from Germany in 1945 to the rockets and shuttles that took man into Space, with every other type of military rocket thrown in for good measure. If you are ever near this, do not miss it as it is well worth a visit. 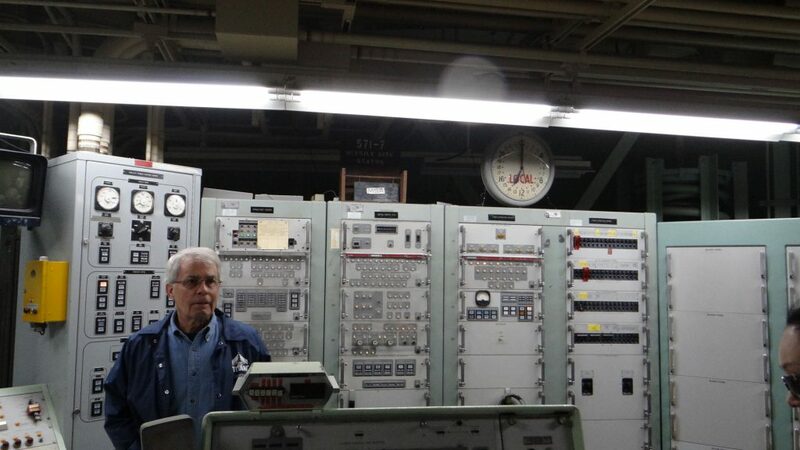 It also includes an area that shows how the first Nuclear bombs were built and tested here. A plaque that sums everything up. 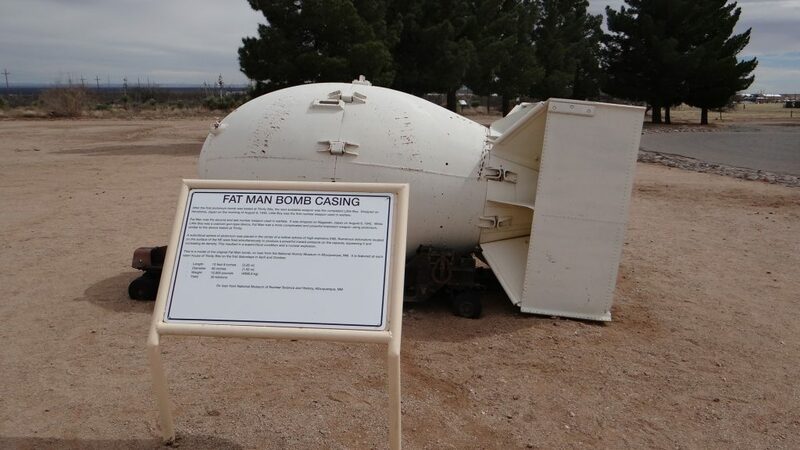 An original bomb casing designed for “Fat Man” the second atomic bomb dropped on Japan at Nagasaki. 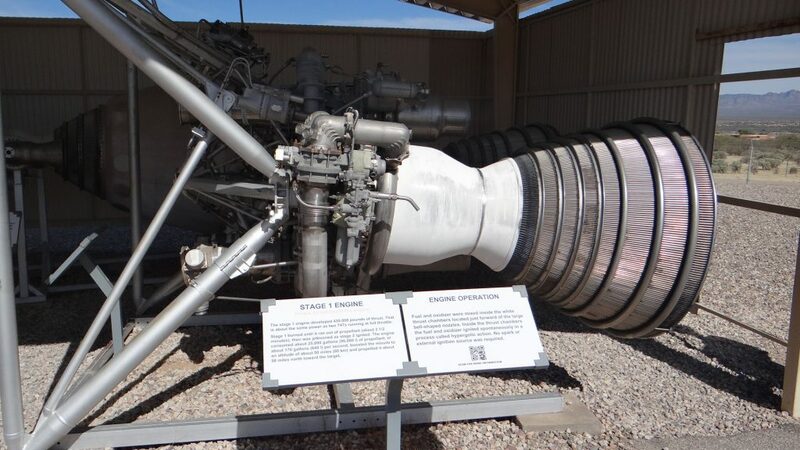 The forerunner of the rockets used to take man to the moon and also to power the ICBM Titan missiles. Just a small part of the hardware on show. 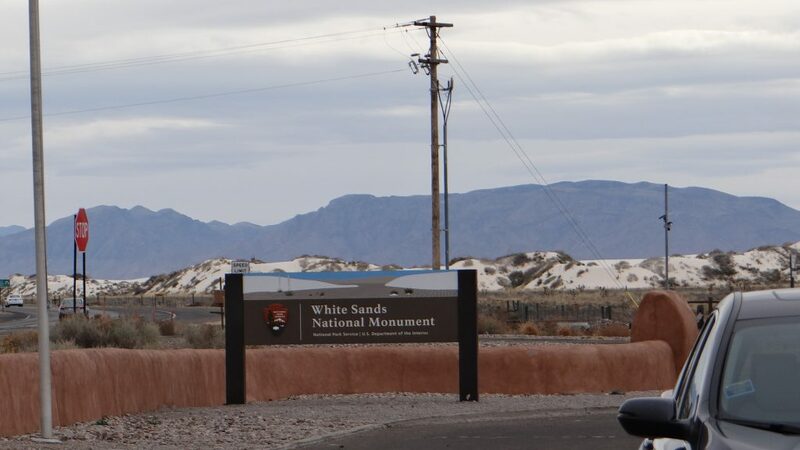 We then moved on to the White Sands National Memorial. 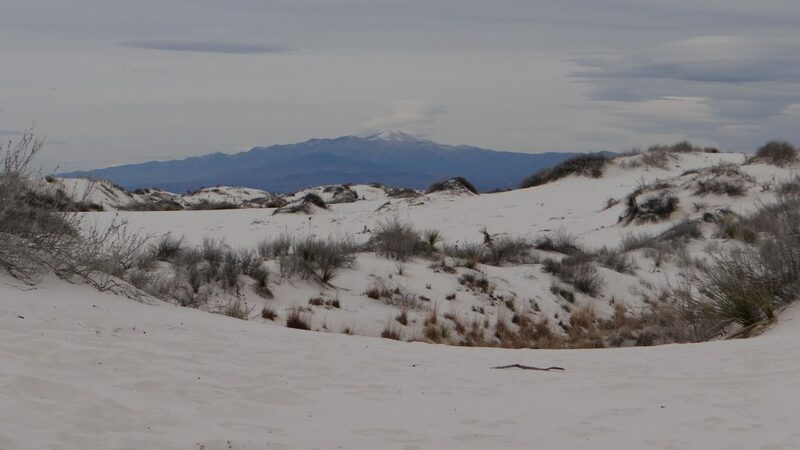 This is an area of pure white gypsum sand formed by the rain washing the gypsum down from the surrounding mountains into this natural basin, and the wind forming the sand dunes from the deposited gypsum. 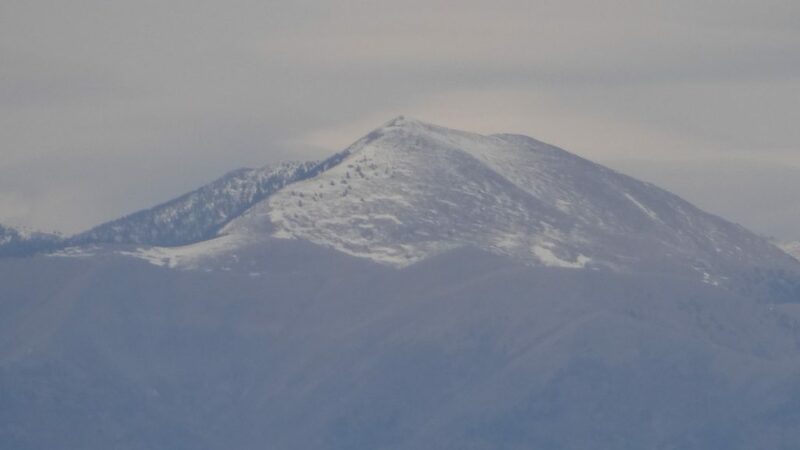 Our pictures do not really do it justice as it had started to get cloudy and overcast, so they don’t really show how white it is. 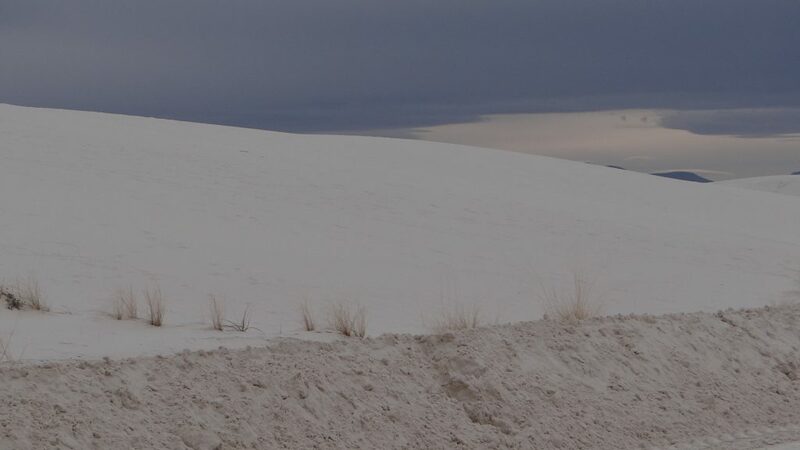 Entrance to White Sands National Monument. 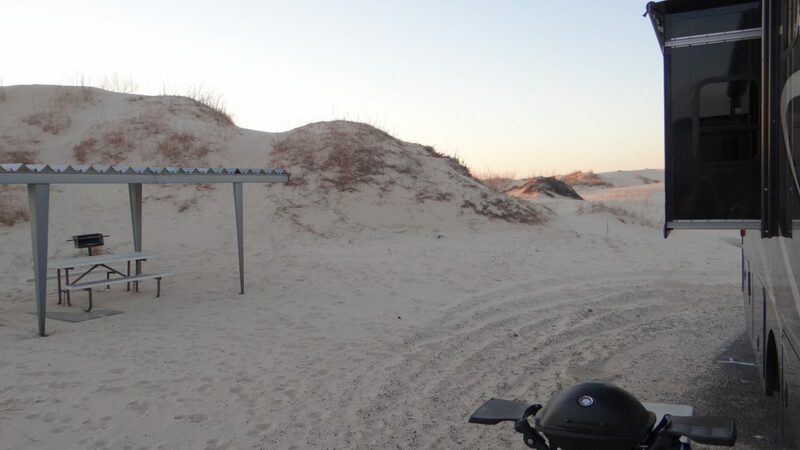 A boardwalk you can take deep into the sand dunes. 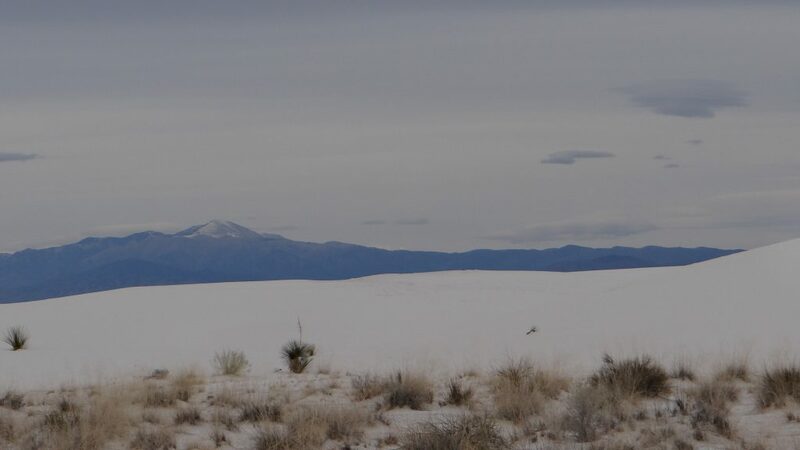 Pristine white sands with a snow covered mountain the background. And again with the ploughed back road in the foreground. The following day we had to do the more mundane tasks of travelling in an RV, shopping for groceries, laundry and cleaning everything. It amazing how much dust gets in and on a moving vehicle and the tow car. 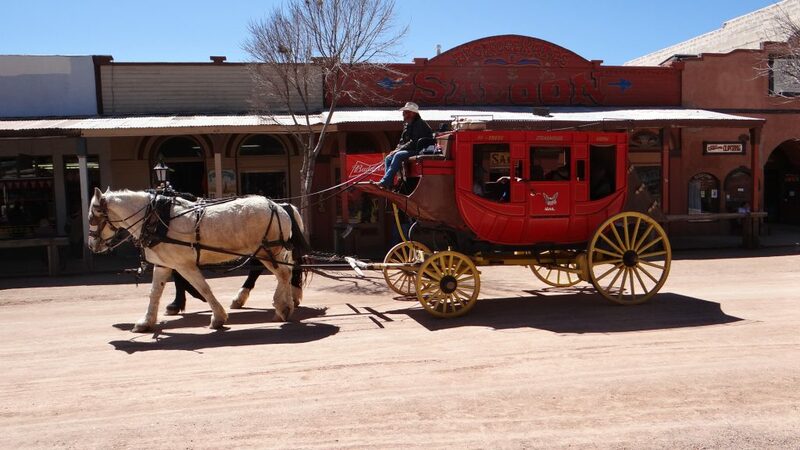 Then we set off for our next destination, Tucson via an overnight stop at a place called Lordsburg that can only be described by that American saying a “one horse town”. So pleased it was only an overnight stop, completely gravelled camp ground and nothing to see except a small main street and the railway tracks!! RV, Spark and Co-Captain parked up in the Rest Area. 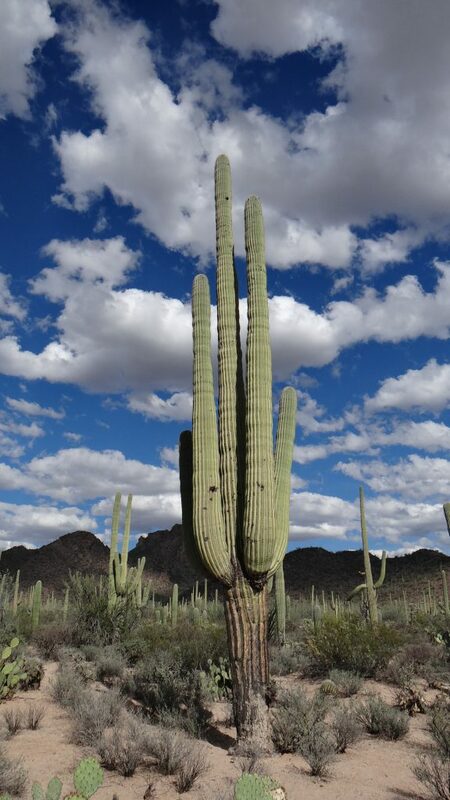 Tucson, however was another story. 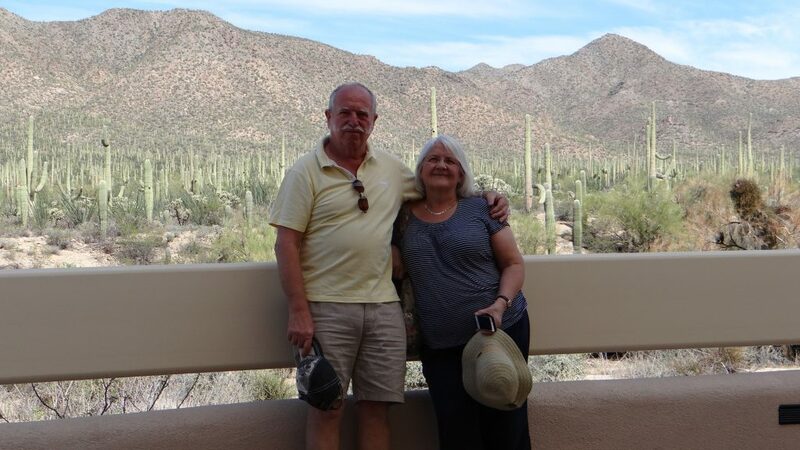 Firstly we met up with Anne’s cousin Elizabeth (Liz) and her husband Tim on the night we arrived at Valley of the Sun RV Park (which by the way lived up to its name and was very sunny). Had an Italian meal and talked to them for ages about what there was to do around Tucson, which turned out to be quite a lot!! 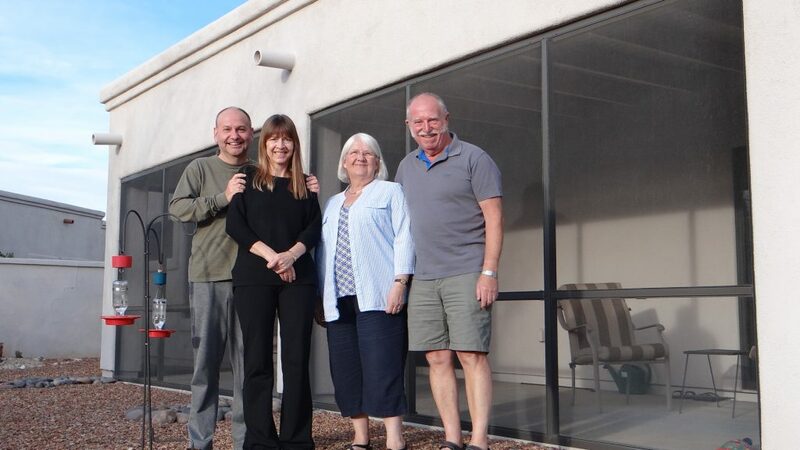 Liz, Tim and us outside their house in Oro Valley, Tucson. 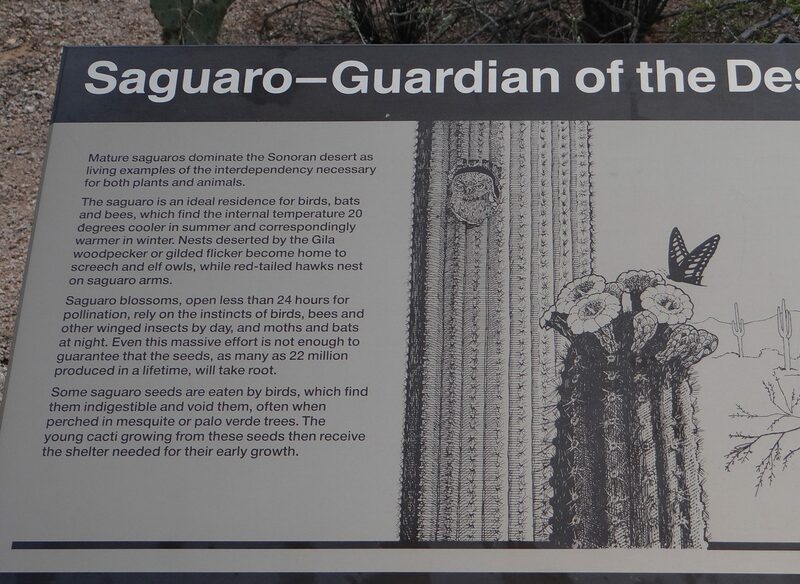 Our first day in Tucson was spent visiting the Saguaro National Park which is at the heart of the area where Saguaros grow as they only grow around the Tucson area. 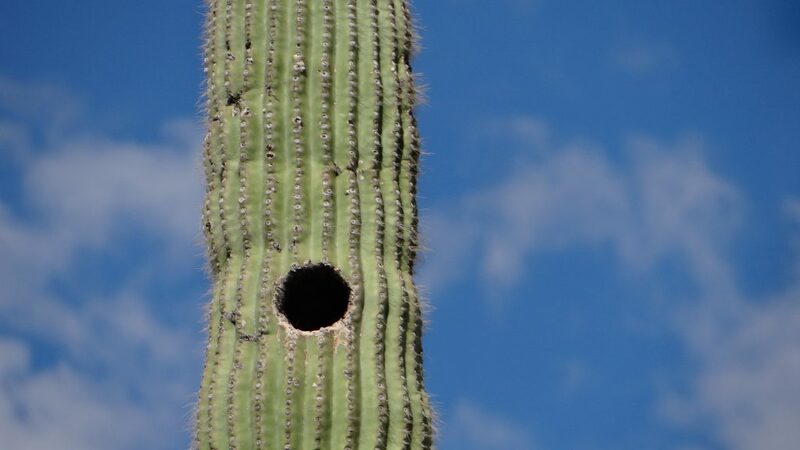 What are Saguaros I hear you ask? 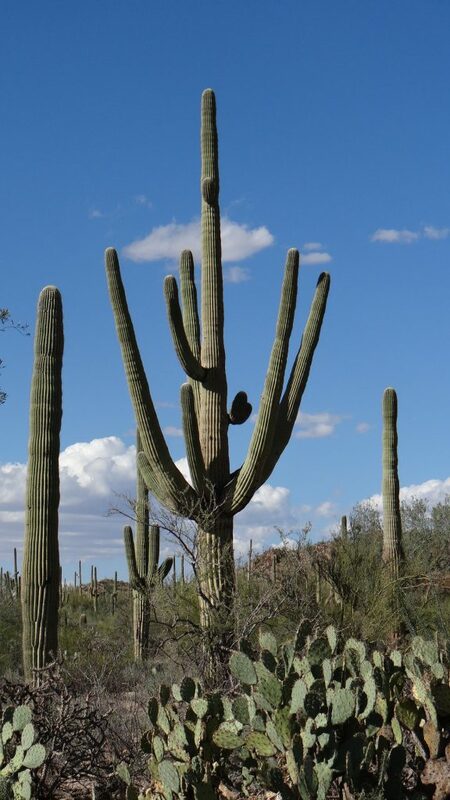 They are those iconic cacti you see in the Western films standing up straight and looking like pencil men with arms!! And there a lot of them, look in the background. We spent ages walking around the exhibits and hearing how the local Indian (“native Americans”!!) believe that they represent their ancestors so are treated with respect. There was also a drive through loop which turned out to be an unpaved road more suited for a 4×4 than a Chevy Spark but I managed to avoid any major potholes and the Spark survived!! 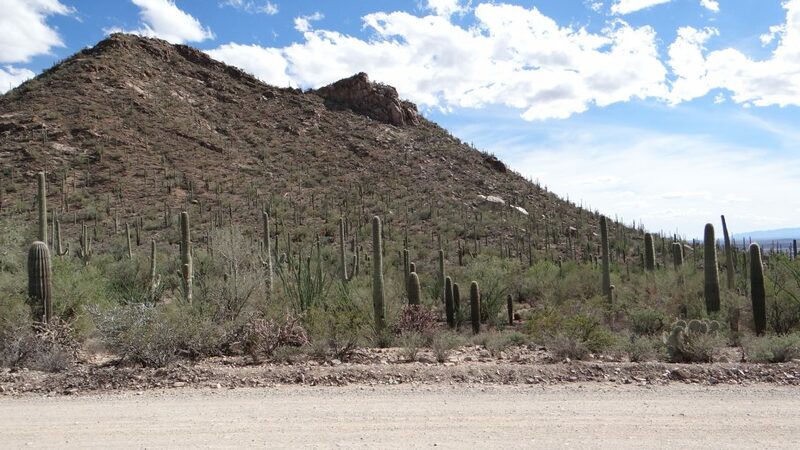 Track in the foreground and Saguaros as far as the eye can see, even, if you look carefully, on top of the hill. 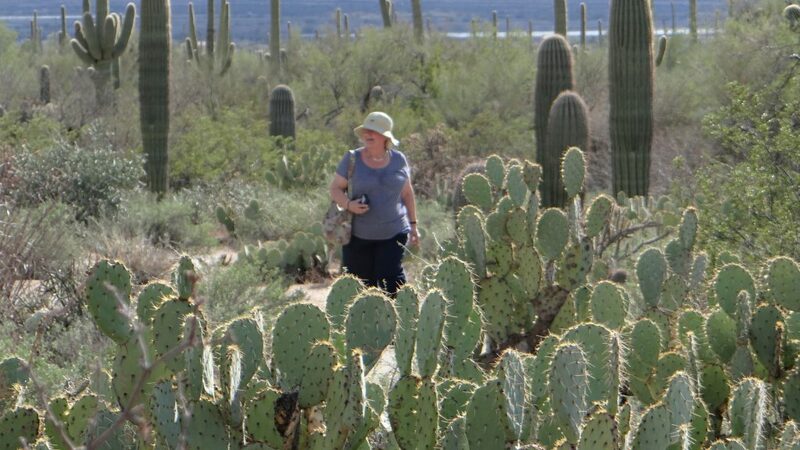 We also walked around a fascinating nature trail that wound around the park through the Saguaros and other cacti, although the “Beware of rattlesnakes and scorpions” signs were a little bit disconcerting, but we didn’t see any!! A very tall one with multiple arms. 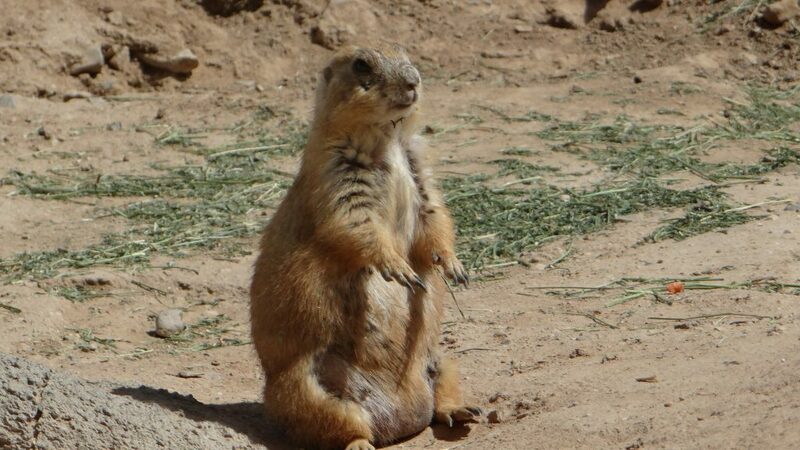 They do not develop arms until they are at least 75 years old and can live for over 200 years. Unusual 3 tiers of arms, they normally have only 1. 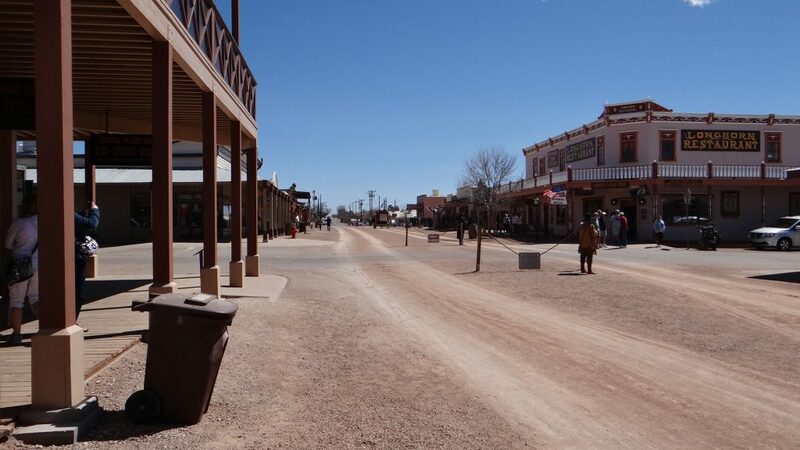 The next day in complete contrast we visited Tombstone the scene of the Gunfight at the OK Corral. Very interesting town making the most of its infamous history. The Main street is much as it was in those days although the shops have changed into multiple gift shops and the Saloons are now restaurants. The Stage is in town. This is the Tombstone equivalent of the Trolley Bus Tour. 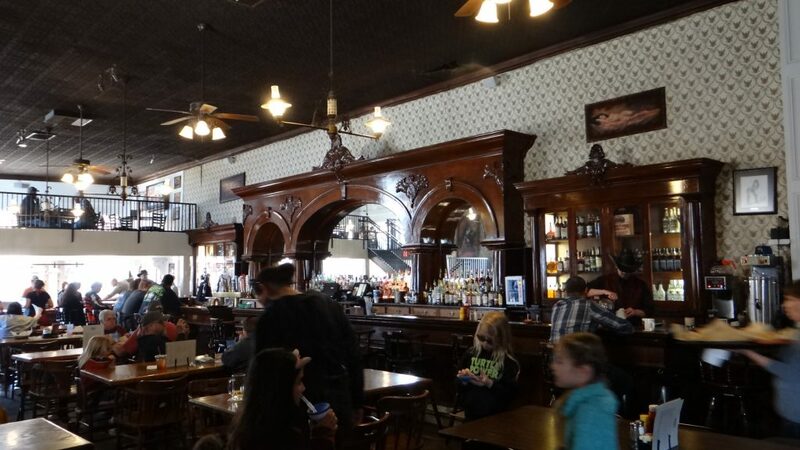 The Crystal Palace Saloon, I missed the 3 cowboys sat at the bar!! 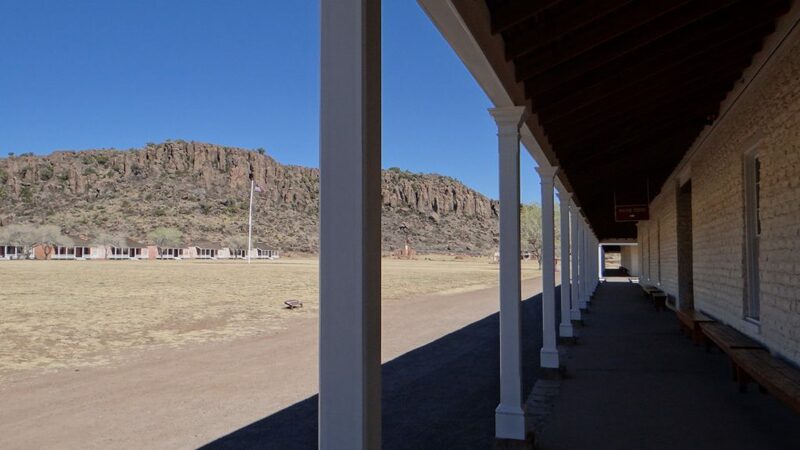 Further down the street we found the OK Corral site and watched a re-enactment of the gunfight. 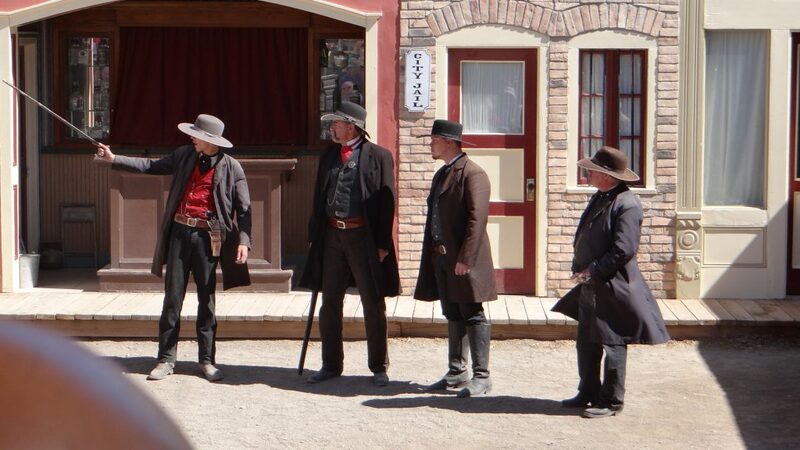 Animatronic version of the gunfight, which is why they look a bit stiff. Morgan Earp and the Clanton brothers. 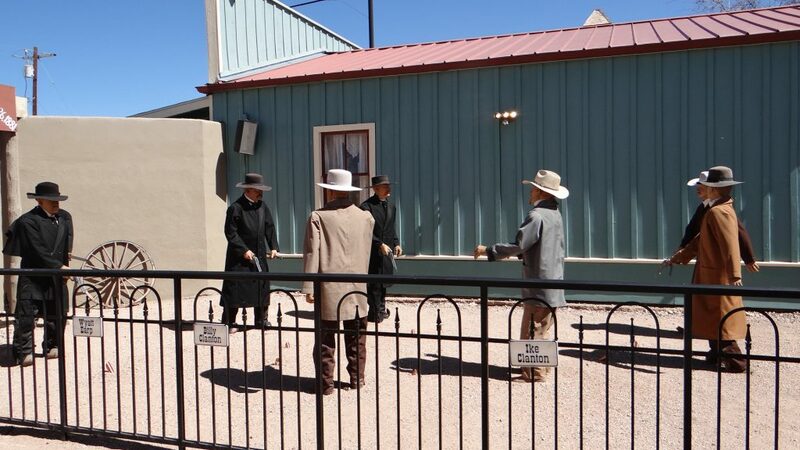 Left to right, Doc Holliday, Virgil Earp, Wyatt Earp and Morgan Earp. 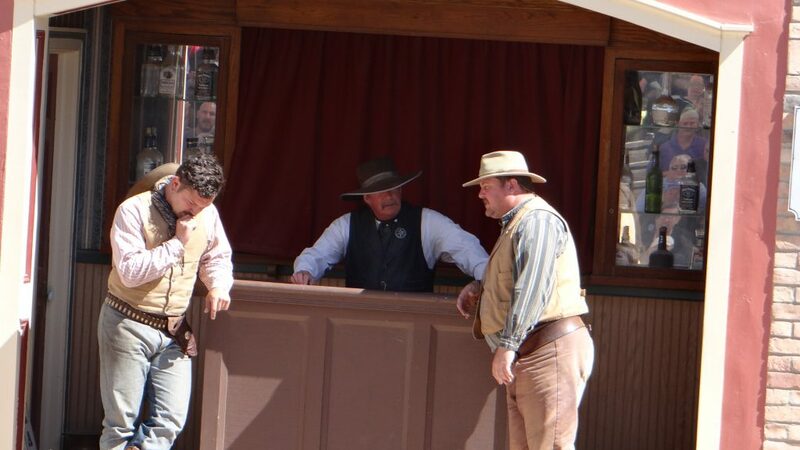 The person playing Virgil Earp looked remarkably like Sam Elliot who played Virgil in the latest film version. Very interesting day, especially later in the day when the wind got up and started blowing the dust around in Main Street. The next day we took it easy and hosted Liz and Tim for a meal at the RV as they had treated us to a meal at their house. Not sure a steak meal cooked on the Weber lived up to the Chicken Tikka Masala they served up for us, but it was an enjoyable evening and they got to see the RV. Trying out the Driving seats!! 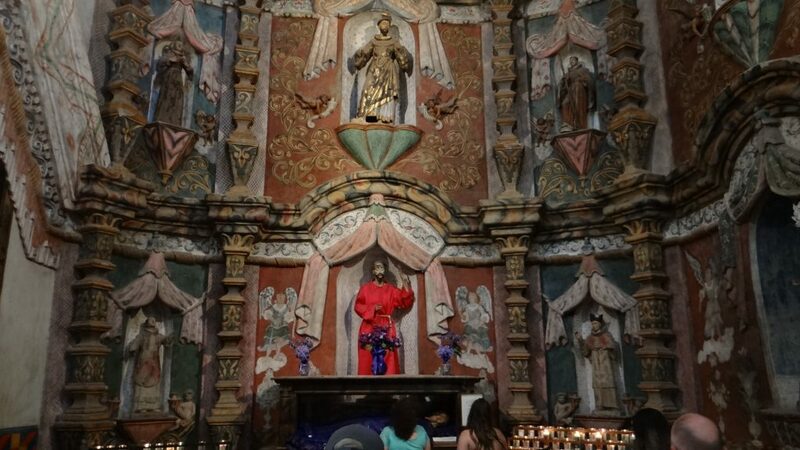 The day after we visited two contrasting places, the Titan Missile Museum and the San Xavier Mission. 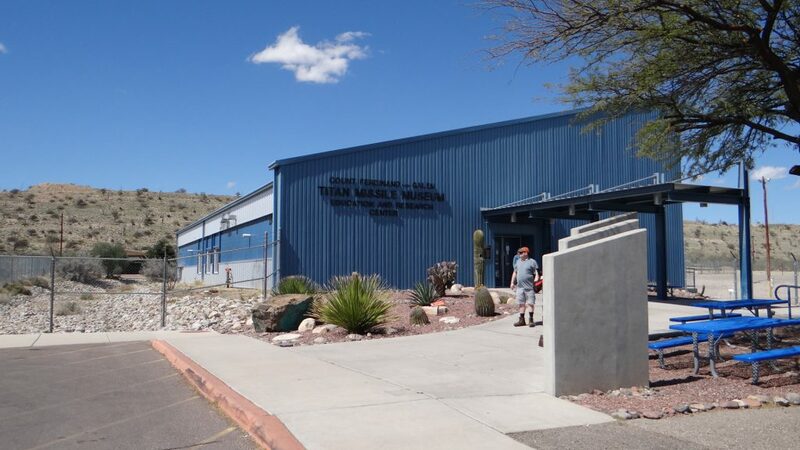 The Titan Missile Museum is the only fully intact example of an original Titan Missile Silo as all the rest were blown up and destroyed as part of the Nuclear Disarmament Treaty. 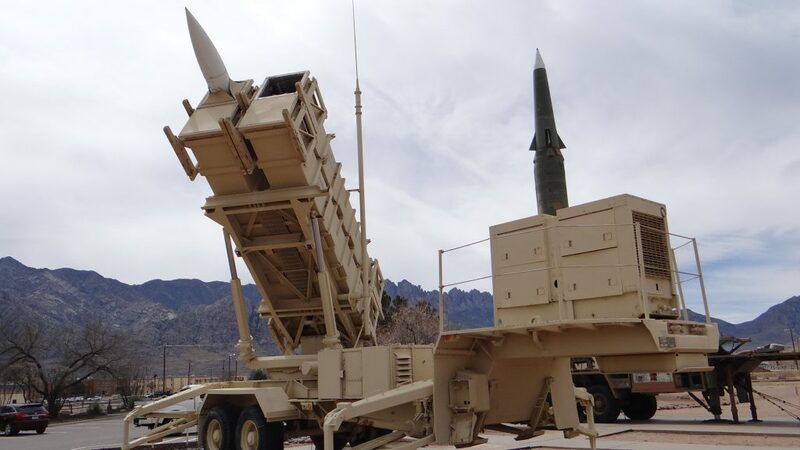 If, like me, you like missiles, electronics and all the gizmos this is a great place to visit on one of the guided tours, but I am not sure Anne was as enamoured as I was. 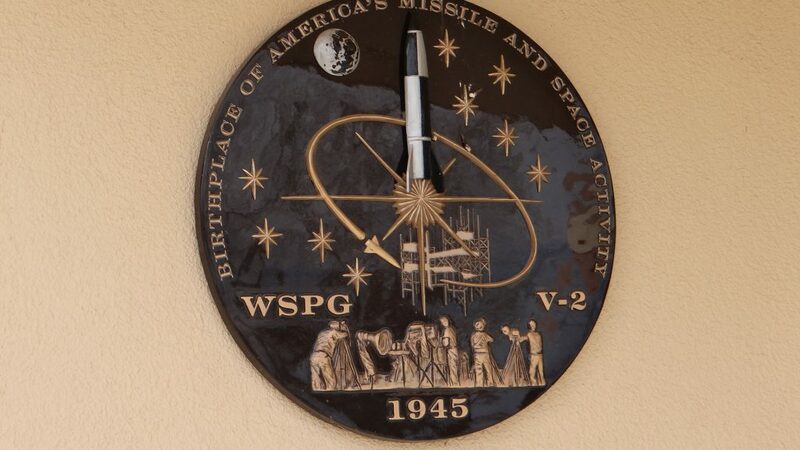 The guide was an ex Air Force technician who had worked there when the site was operational. Main control room and our Guide. 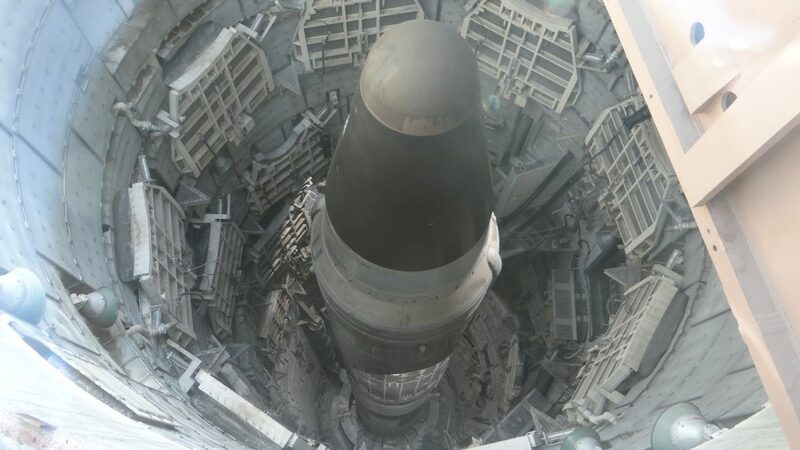 Looking down into the silo at the Titan II missile. 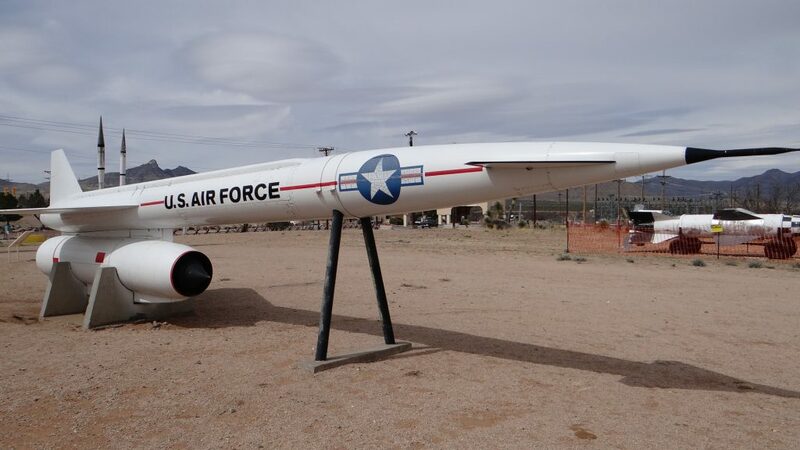 To prove it was a decommissioned site as part of the Nuclear Disarmament Treaty they had to remove the rocket engines. 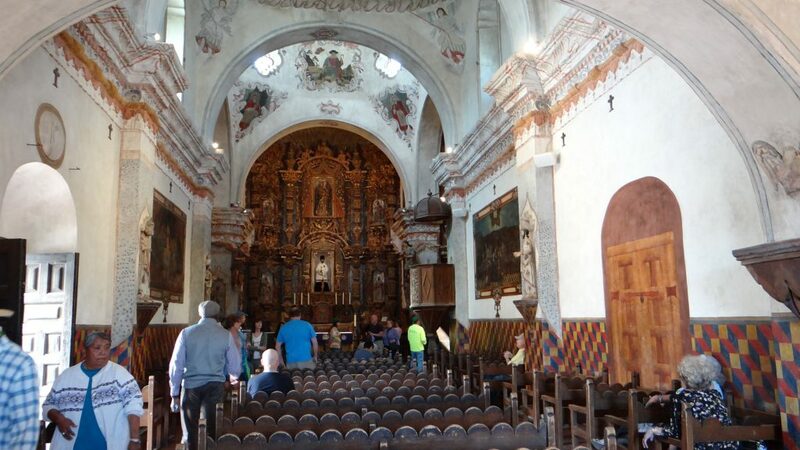 The San Xavier Mission is like the Missions around San Antonio, a Spanish Mission set up to integrate the local population into the Catholic Church as part of the grand plan to tame Arizona. 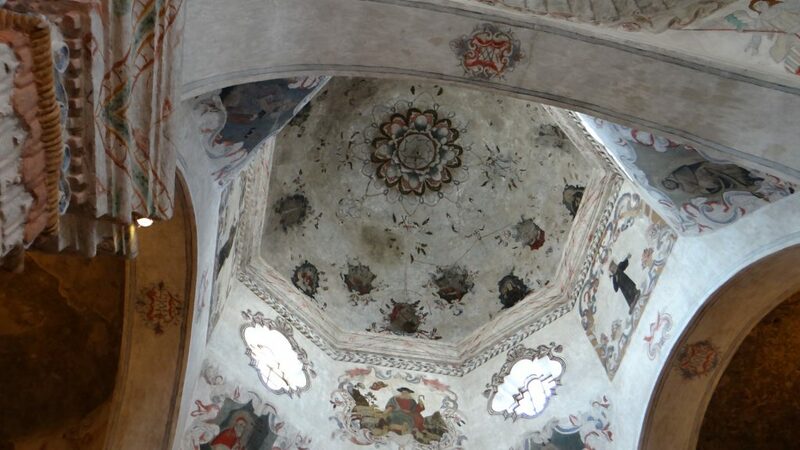 This one, though, is in a class of its own with a magnificent church and absolutely fabulous interior decorations. 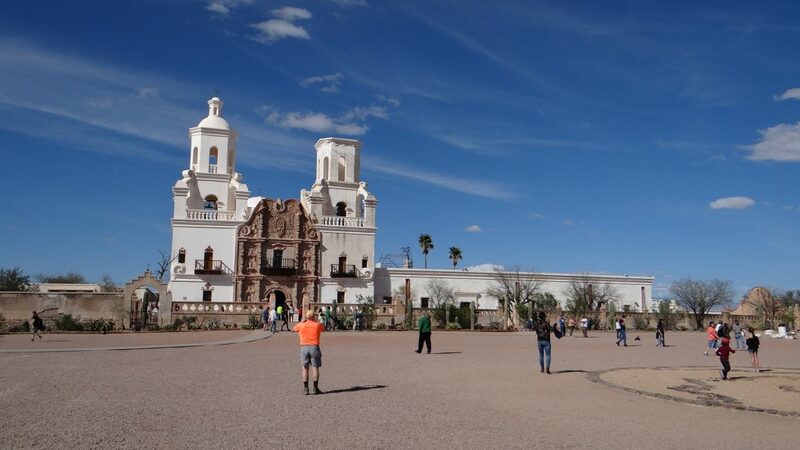 The Mission, the bell tower on the right was never completed. 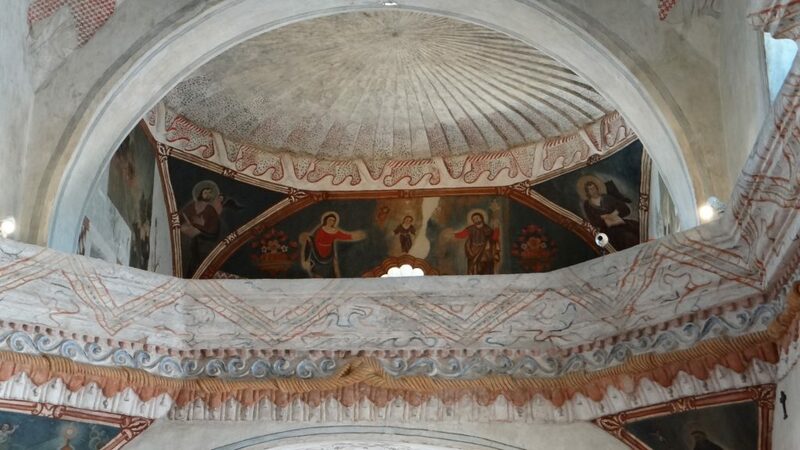 The artwork on the dome. 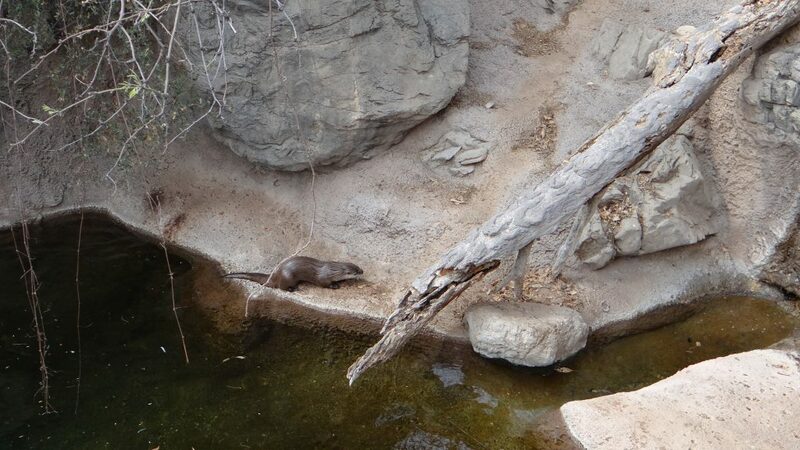 Next on our list was a visit to the Arizona-Sonora Desert Museum, another place like the Dallas Aquarium is misnamed as it is much more then a Museum!! 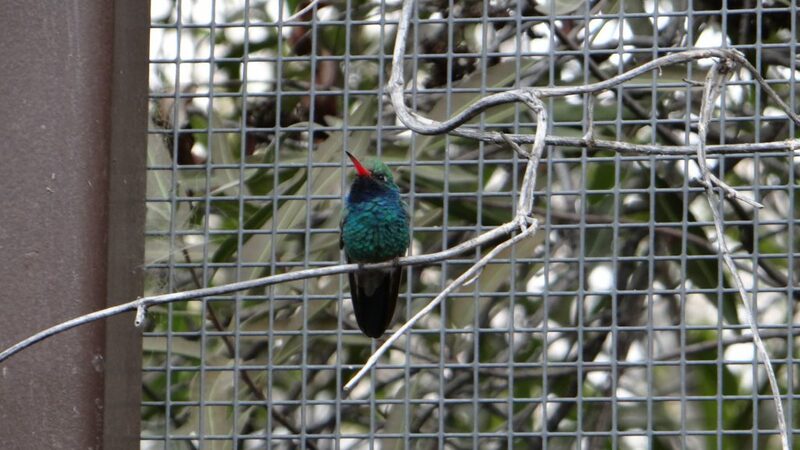 Zoo, Gardens, Museum, Natural Sciences and much, much more. 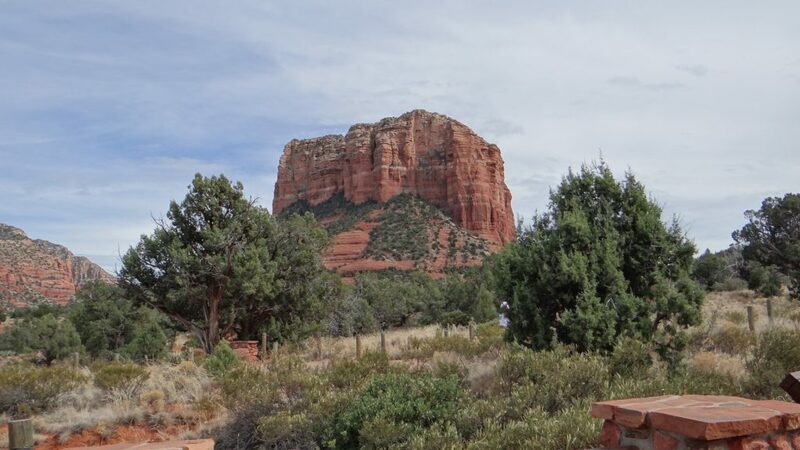 If you get a chance to visit it do so, but make sure you have the whole day as if you don’t you will not see all of it. A panoramic view of the Museum. All the exhibits are the trails that wind through the gardens. 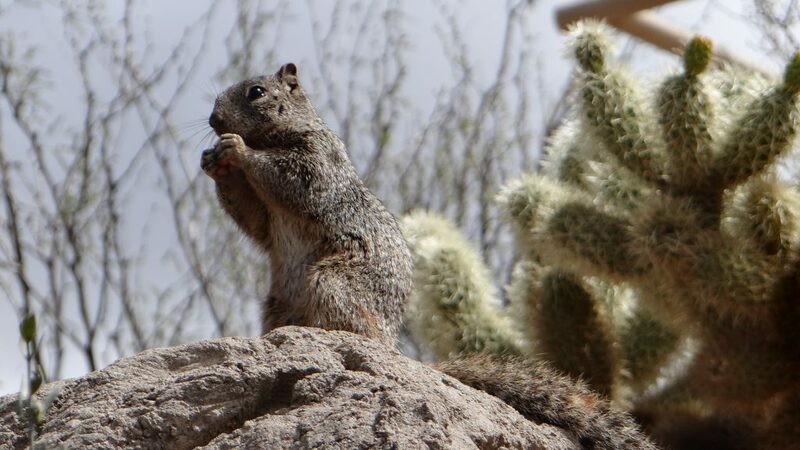 One of the many free ranging squirrels that live in the museum. 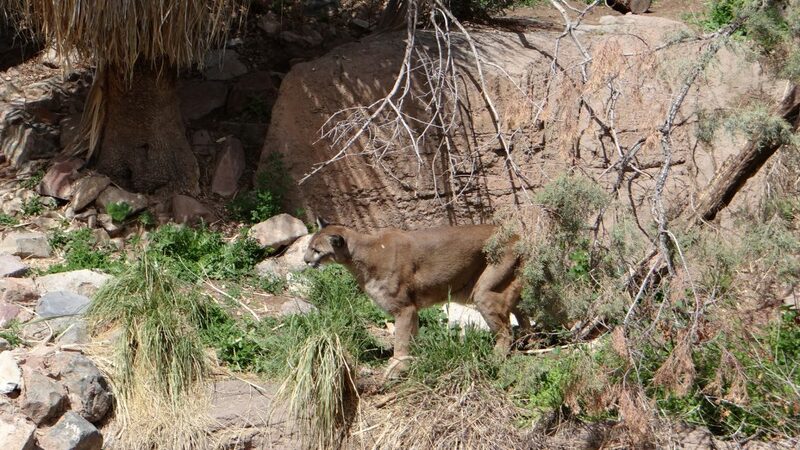 Mountain Lion, he had seen something, perhaps the squirrel!! 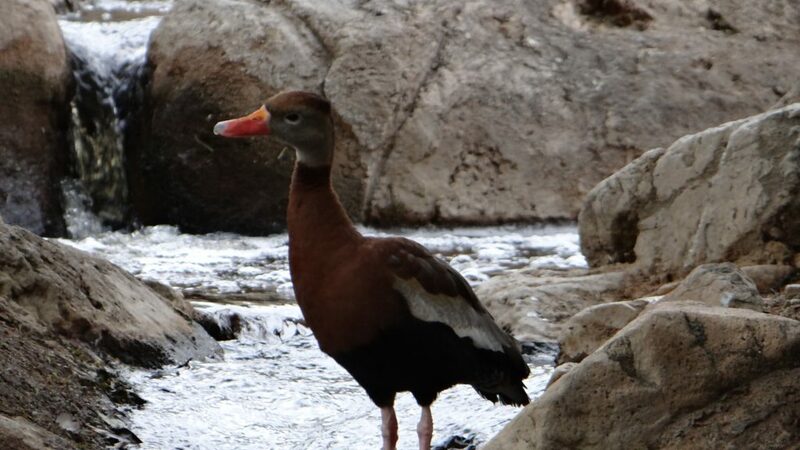 Duck – not sure what type!! 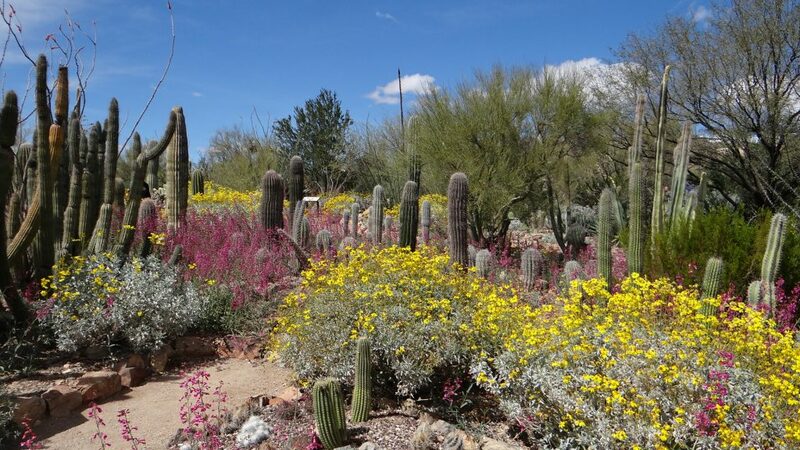 Cactus bloom, smelt beautiful and attracted bees. 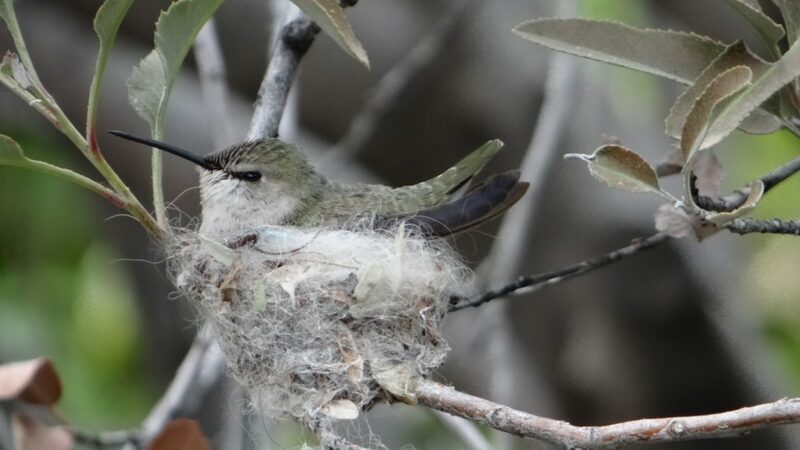 Nesting Hummingbird. 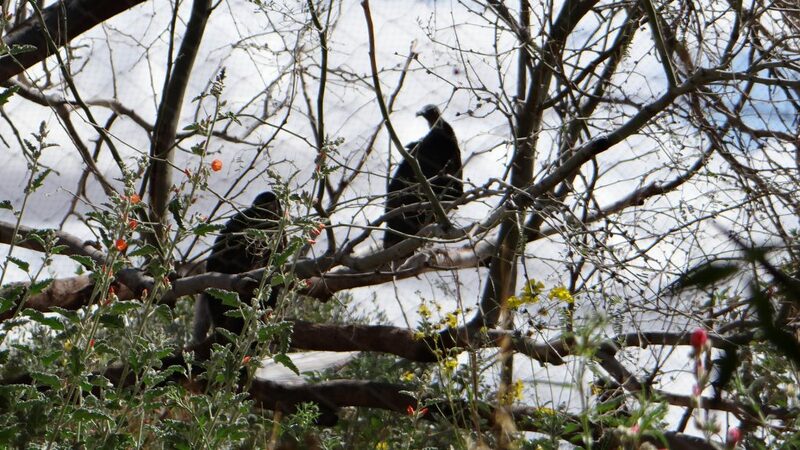 Nests are made with spiders webs to hold it together and on the branch. 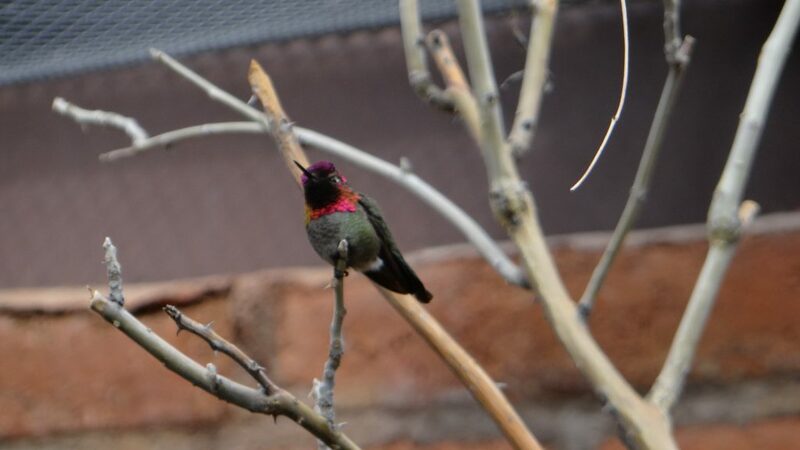 And after one last meal at Liz and Tim’s house we left Tucson realising there was still lots to see. 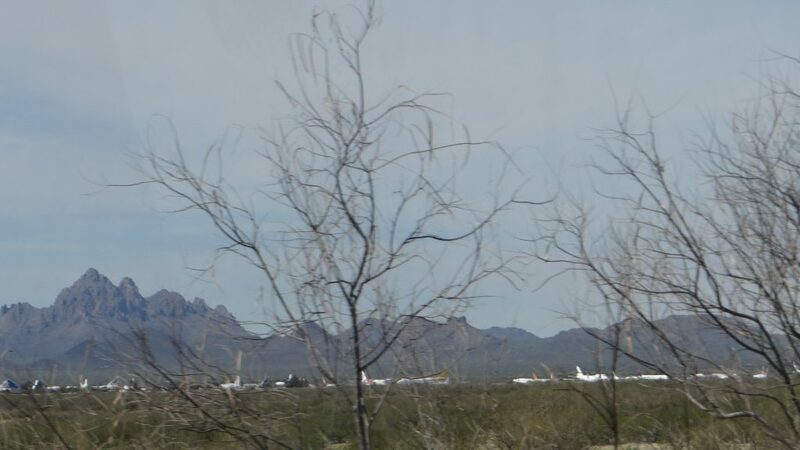 For example this fleeting shot of the Boneyard, where old planes are stored. You can just see the planes, but it is a huge area full of old planes. We then moved onto Phoenix where we met up with Pei Tao, one of the early students who worked at the SALC for Anne. We had a great evening with her husband Kevin and a Japanese student who they were hosting, at a Tapas bar in Phoenix. 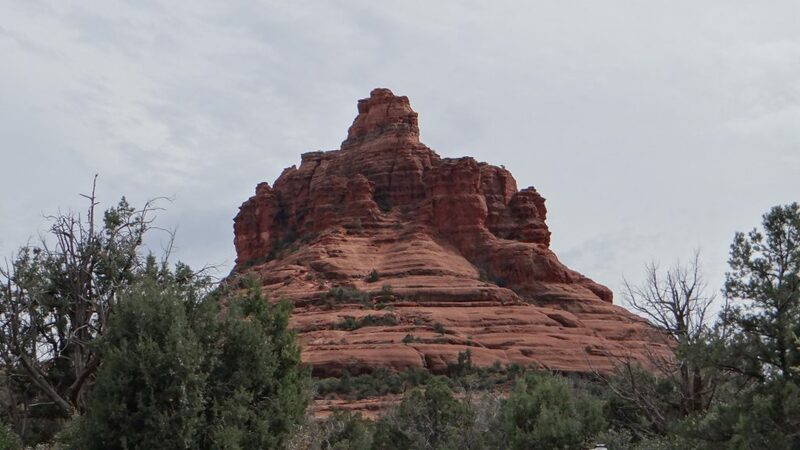 On the recommendation of the person who helped me park the RV at Phoenix Metro RV Park we visited the Coconino National Forest and Sedona, more commonly known as Red Rock Country. 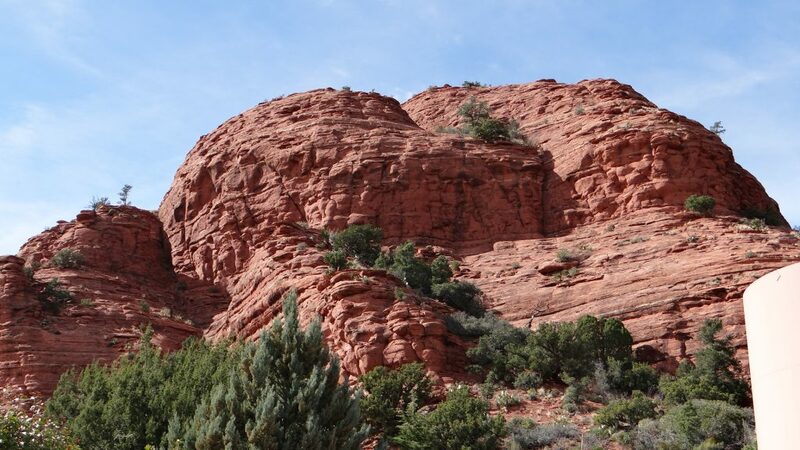 Wow there are some big Red rocks. 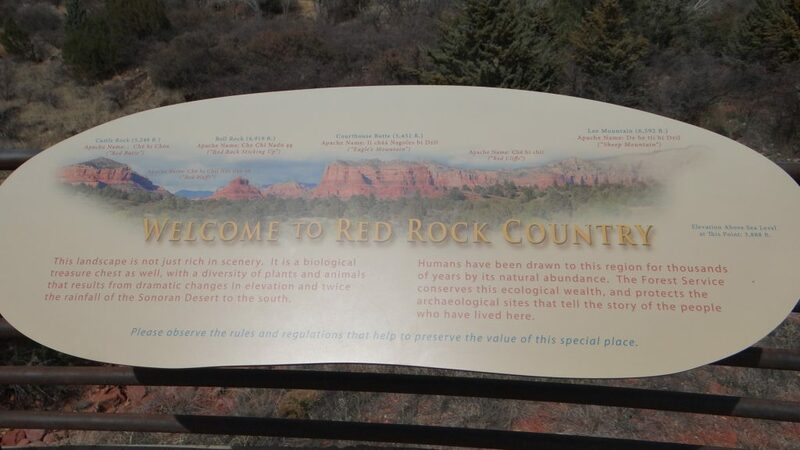 Red rocks in the distance. 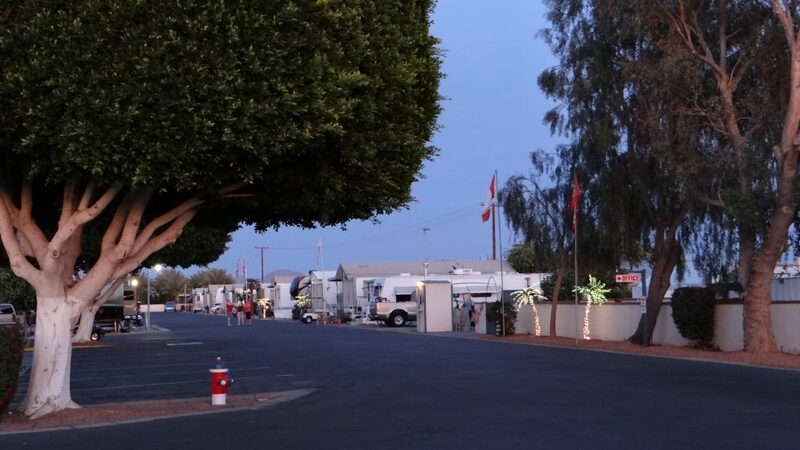 Then we moved onto San Diego via Yuma where we stayed in a lovely campground called Villa Alameda RV Resort. 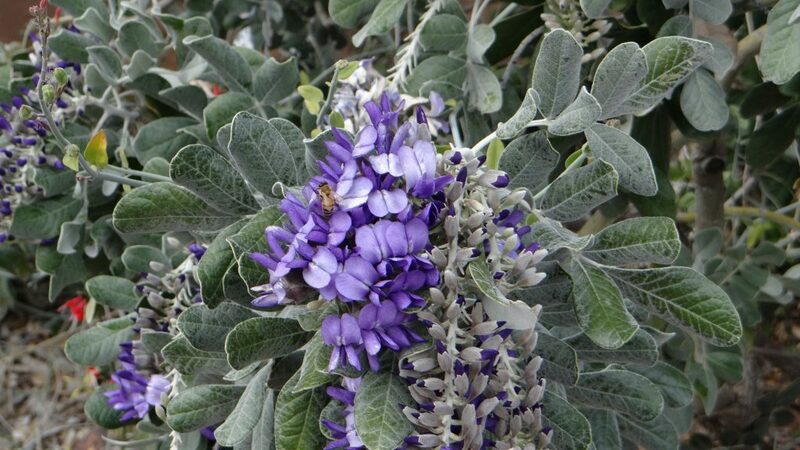 The RVs were parked amongst multiple fruit trees and the park had lots of flower gardens, all of which on an evening with no wind smelt absolutely wonderful. You could pick any of the Oranges, Lemons and Grapefruit from the trees if you wanted fresh fruit!! 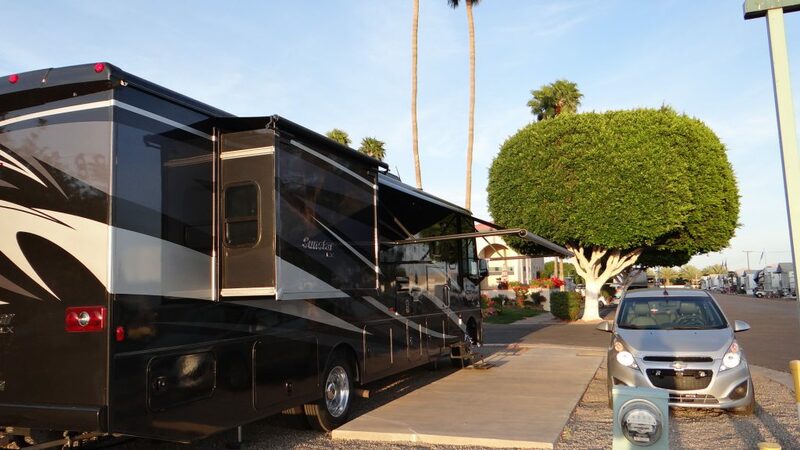 Shiny RV (washed in Phoenix), trees and a flower garden. Evening with LED Palm trees!! 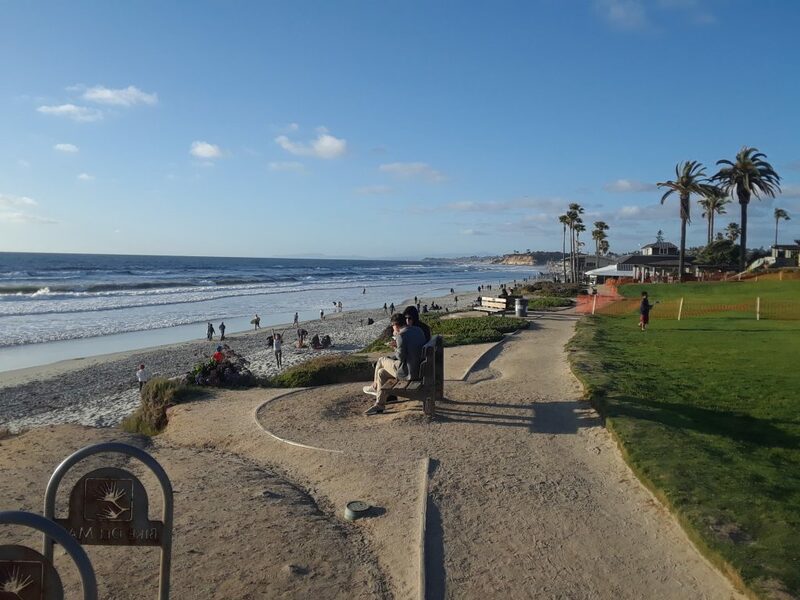 Now in San Diego where we will be while we get the RV Serviced (Oil change and Filter) and fix a steering bush, all of which will be in the next post. 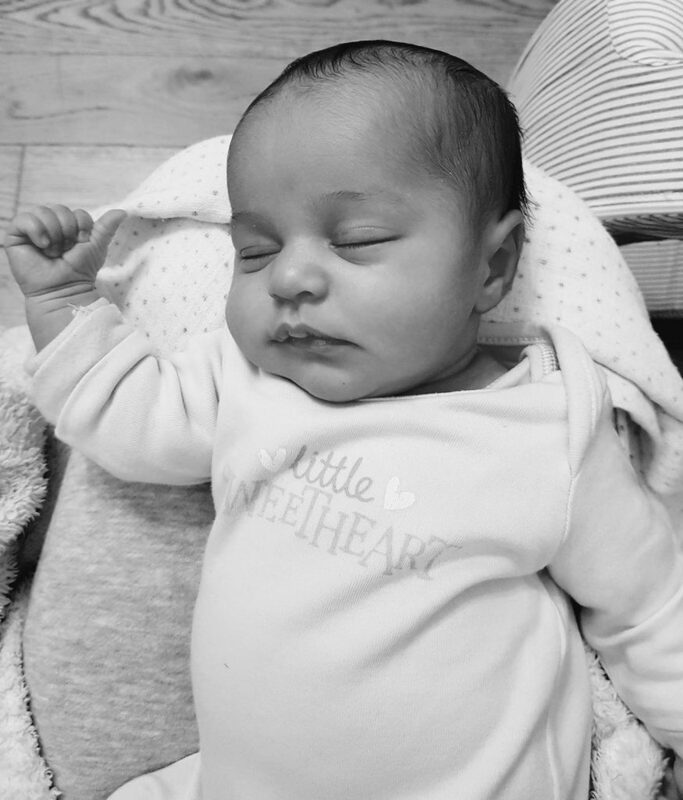 Vancouver here we come …..
Well the first thing to do is to introduce our new granddaughter, Alyssa Rhianne May Jordan, born on the 6th February 2018 and weighing in at 5lb 10oz. Mother and baby did very well and Alyssa has continued to thrive since then. 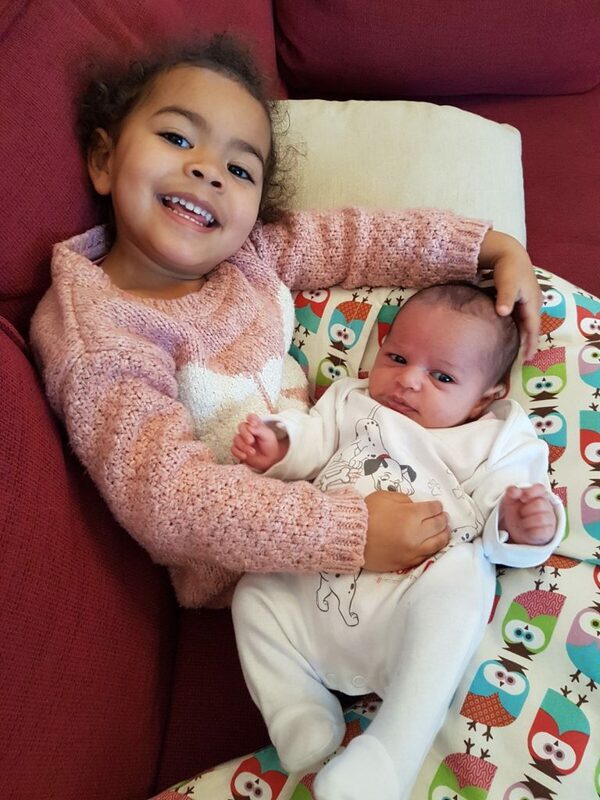 We had to wait a while for the name but Ella set the precedent!! 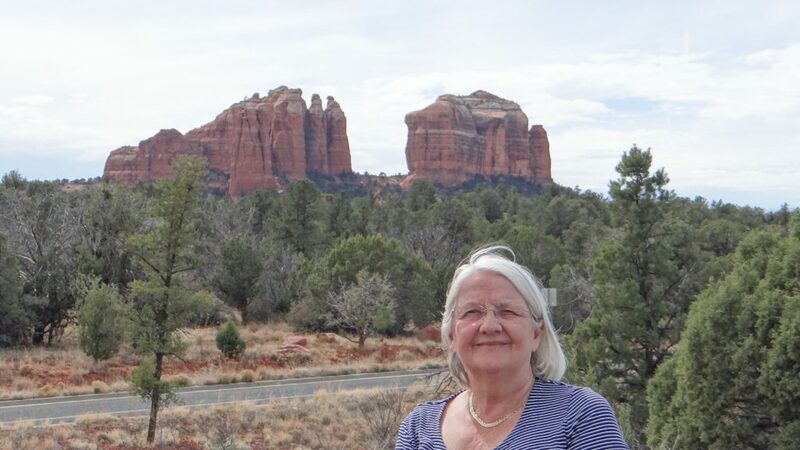 And a week after the birth we returned to the USA on the 14th February to restart our travels. 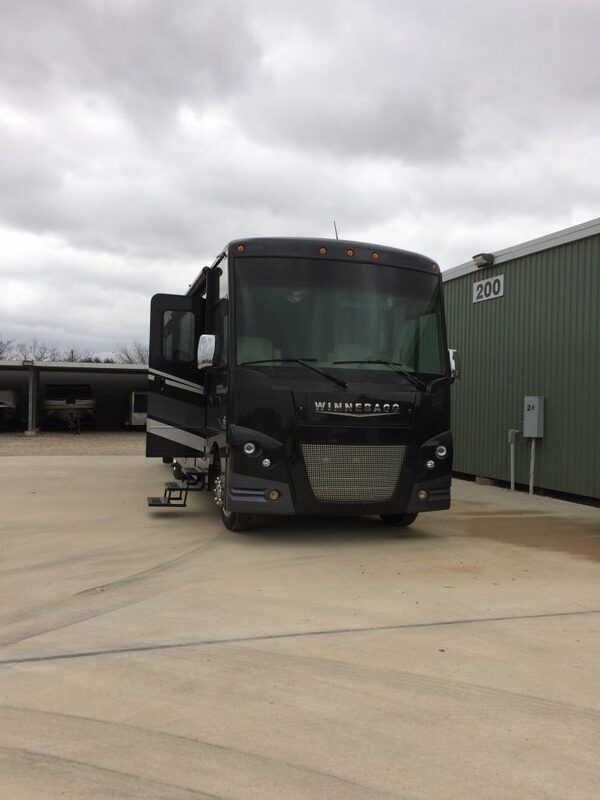 Stayed overnight at a hotel close to DFW airport and on the 15th went out to Keller Storage to pick up “Big Beast” and the “little Beast”. 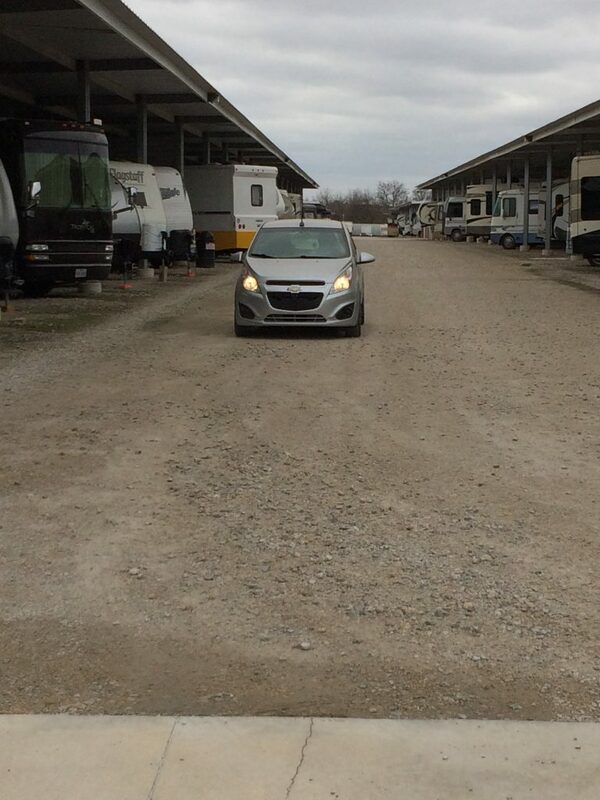 Big Beast started first time and drove up to the front of the storage area with no problems at all. I have obviously still not solved the battery drain problem on little Beast (the Spark) as the battery lasted a week when we went to Jamaica, but 2 months proved too long and it was flat. However, the reserve battery pack started it first time so we were in business. After a little coaxing here is little Beast. After checking all the tyres we hitched up the Spark to Big Beast and set off for Shady Creek where we were welcomed back like we had never been away. First we had to de-winterise the RV water system which involved getting the water supply all hooked up and running all the taps until the purple anti-freeze disappeared. As I said it is non-toxic antifreeze but a kettle boiling purple water doesn’t look good. Took about 2hrs to complete ad we were all back up and running. Later on in the week I sanitised the fresh water tank which is only used when we on the road. The first two days were bliss, 20C plus and then the bad weather set in. The temperatures went down (but not as low as the UK), and the rain started, and did it rain, over 6.5in in 3 days!! The reason for the wait was to get a braking system fitted to the Spark. 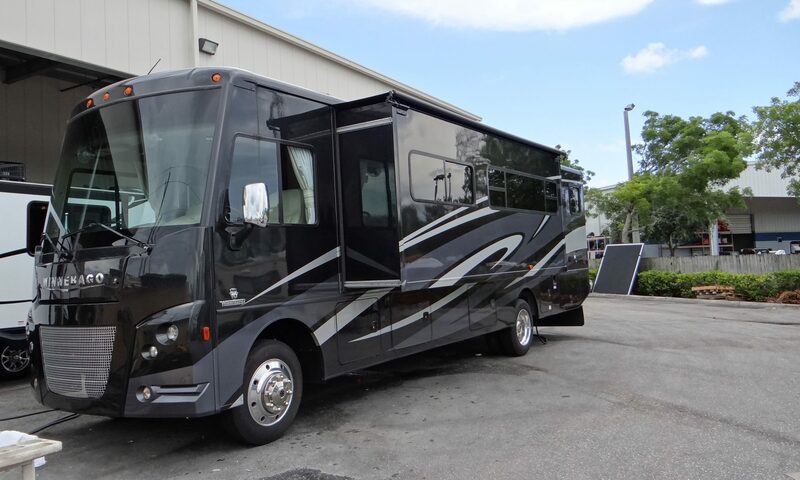 By that I mean a way of making the Spark brake when the RV braked which is a requirement in California and Canada, two places we are due to visit in the next 10 months. 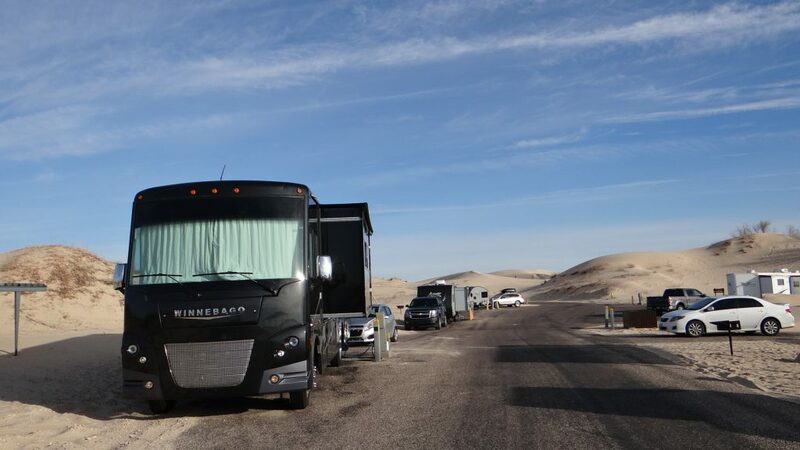 When we originally bought the RV we were told that fitting a braking system to the Spark was rather silly as you had 22,000lbs of RV stopping 1,750lbs of Spark which it was more than capable of, but the law in California and Canada says we have to do it, so on the 20th March a BrakeBuddy Stealth was fitted to the Spark. 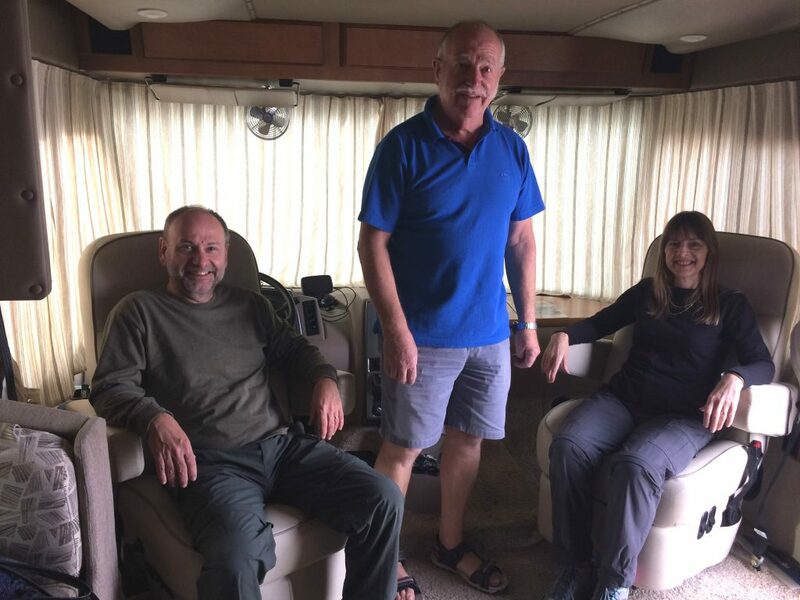 After a few teething problems caused by a bad wiring job way back by Palm Beach RV (one stop light had the wires reversed) we had a working braking system, so we were ready to leave after we had stocked up the RV. 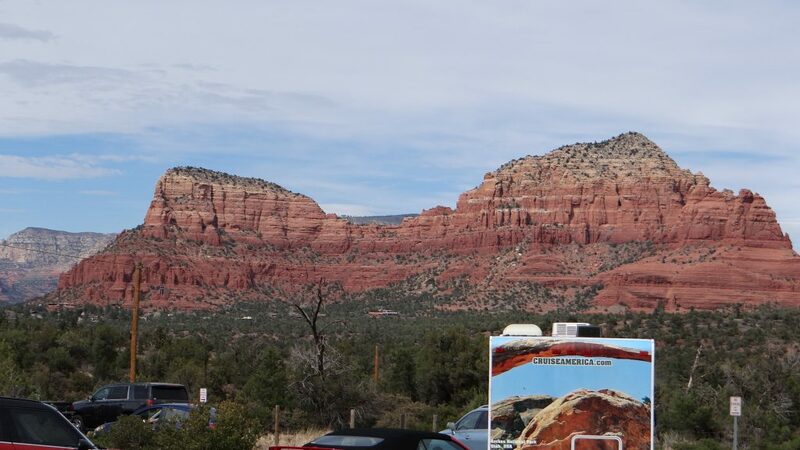 So on the 1st March we left Shady Creek RV and set off. 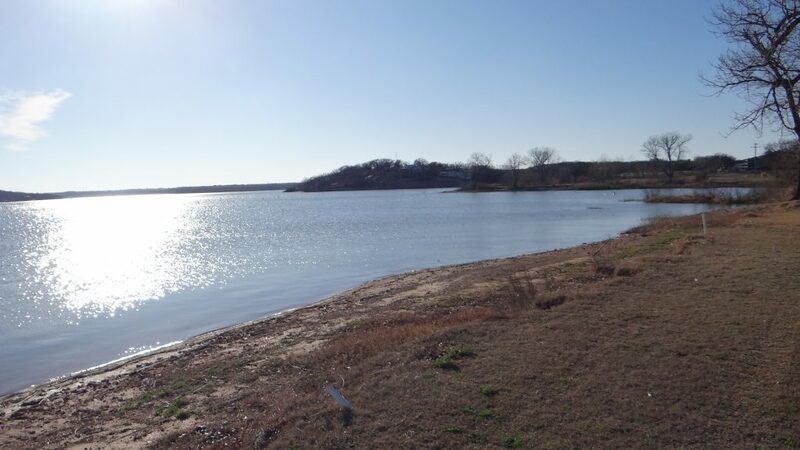 First stop was the RV park we used on way back from Abilene before Christmas, Solid Rock RV. By now the weather had started to improve and we got another beautiful sunny welcome. From here we moved on the next day to Bar J Hitchin’ Post RV park and the next day we arrived at Monahans Sandhills State Park. 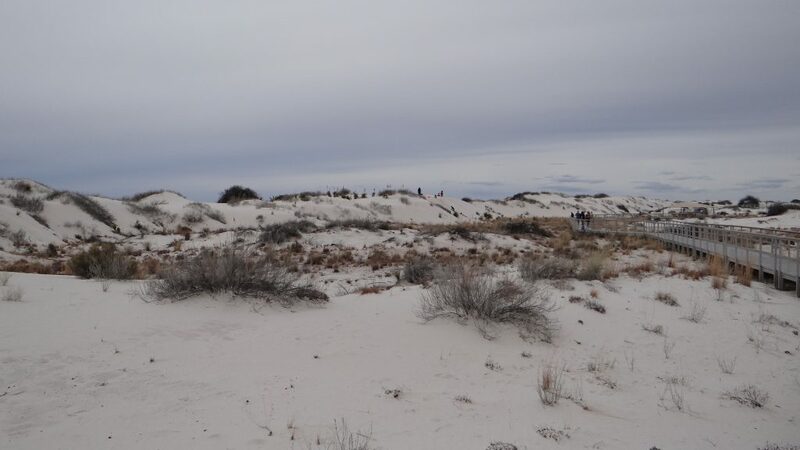 This is a Texas State Park set in the sandhills near a town call Monahans. 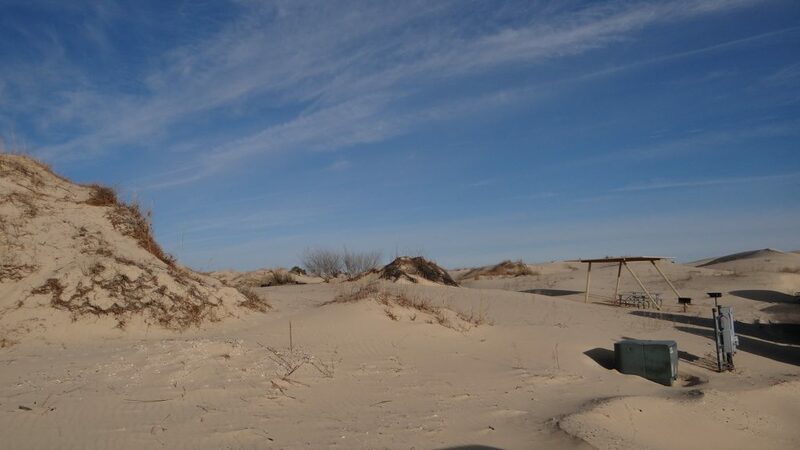 A very interesting and beautiful park, where you toboggan on the sandhills! Gas barbeque set up and ready to go. 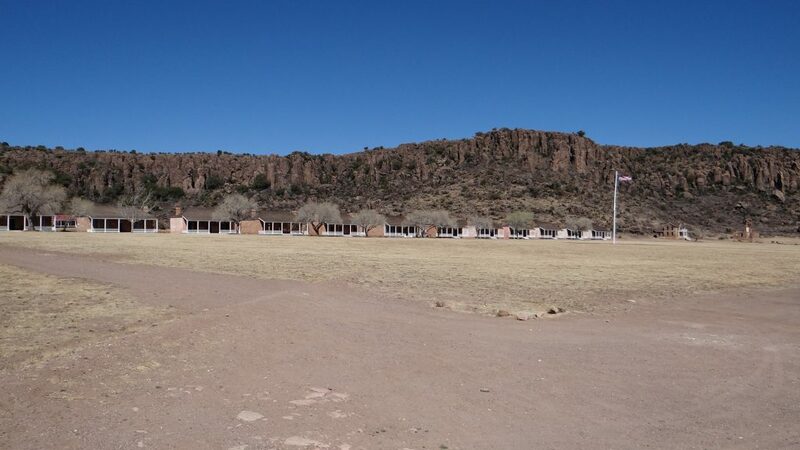 Part of the reason to stay here was to also visit two historic frontier forts used by the “Buffalo Soldiers”, units of the US Army Calvary manned by coloured soldiers. 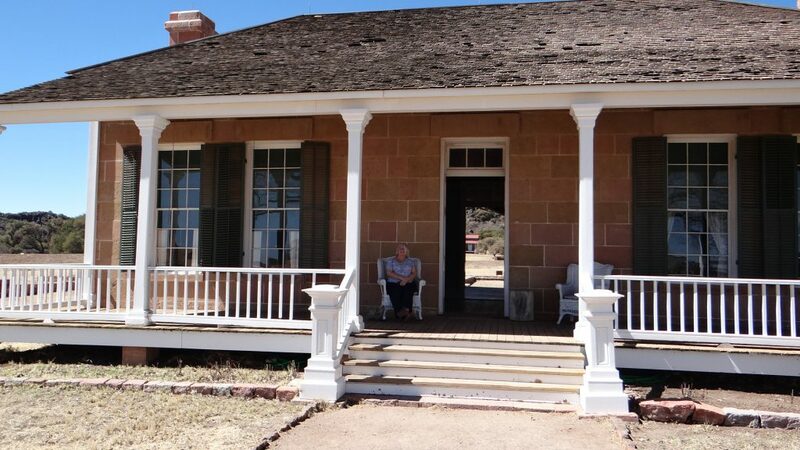 The first we visited was Fort Davis, which was by far the best and a most interesting place. 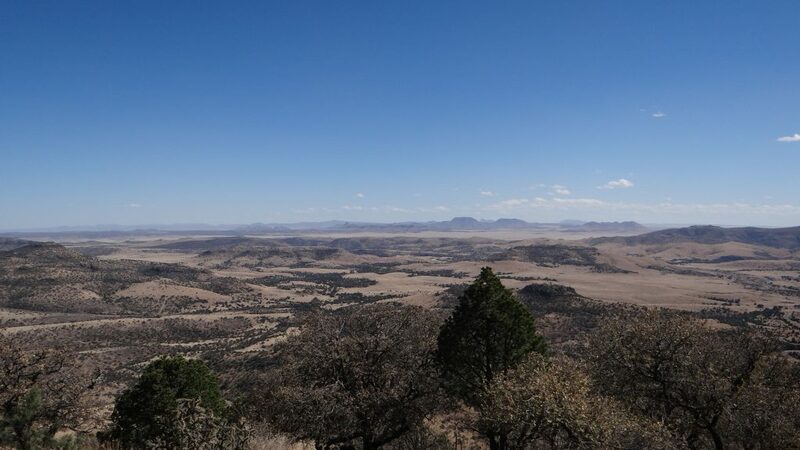 Here you are 4,500ft up in the Texas hills and you come upon a huge fort nestling in a natural flat plain surrounded by mountains, that was used to protect the settlers route from El Paso to San Antonio from marauding Apache Indians. Someone fancied the Fort Commandant’s wife’s chair. 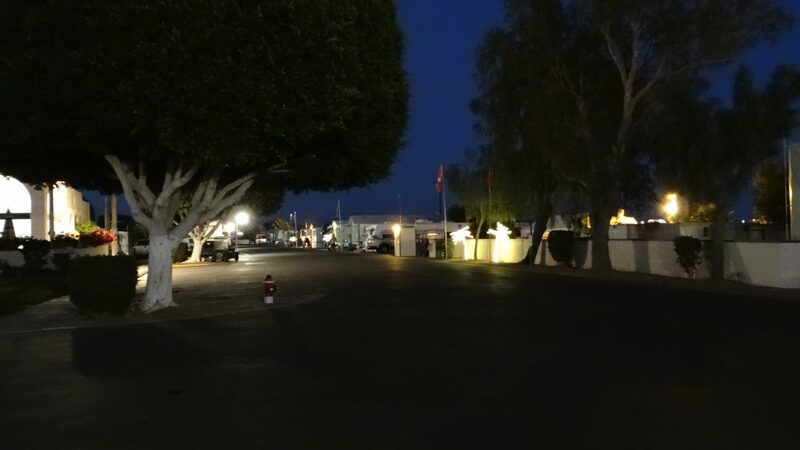 View across the square to the Barracks. 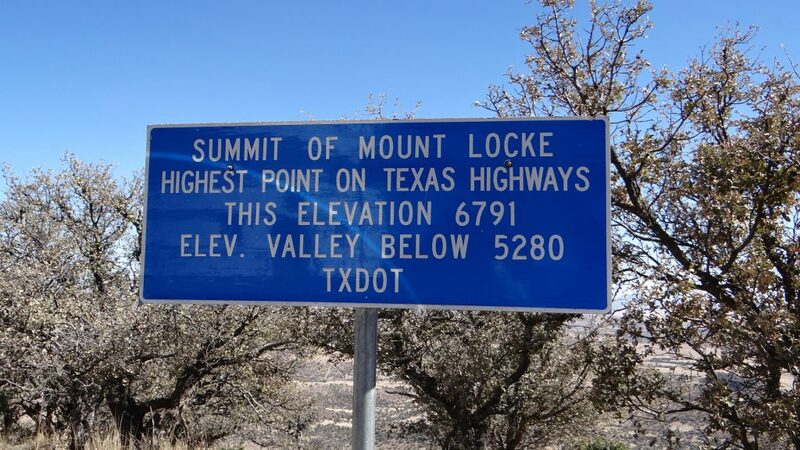 This took a few hours to walk around but luckily we had left early, so afterwards we visited a local Deli called Stone Market and had cup of coffee and some really nice sandwiches, and then moved onto the University of Texas’s McDonald Observatory. 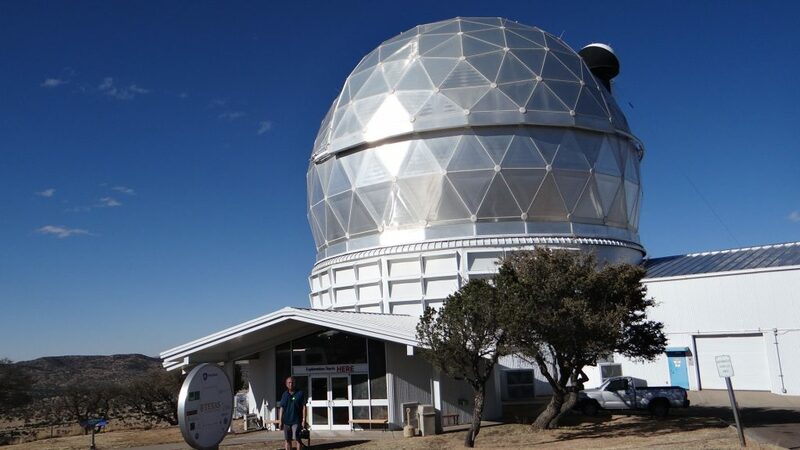 Here we managed to get included on a tour of one of the Observatories and their newest telescope, the Hobby-Eberly Telescope which has the 3rd largest mirror in the world, all at a height of 6791ft up in the Texas mountains. Our guide was very informative, being married to one of the technicians on the Hobby-Eberly Telescope and an ex Spanish Teacher who had taught herself all about Astronomy in about a year!! With views to match, that is Mexico in the distance. 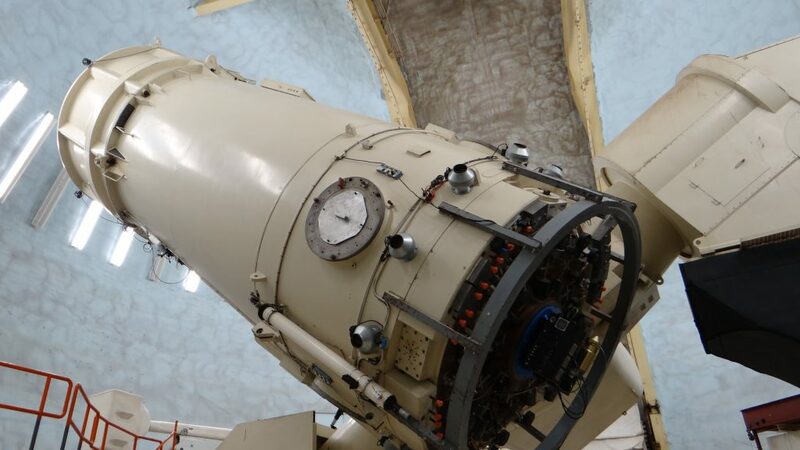 Now that is a telescope!! 103in mirror which puts 41st largest in the world. 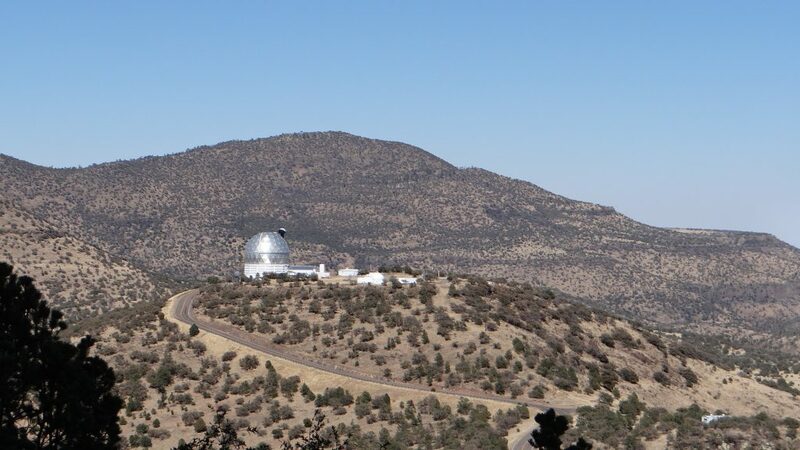 Hobby-Eberly Telescope from the McDonald Observatory. 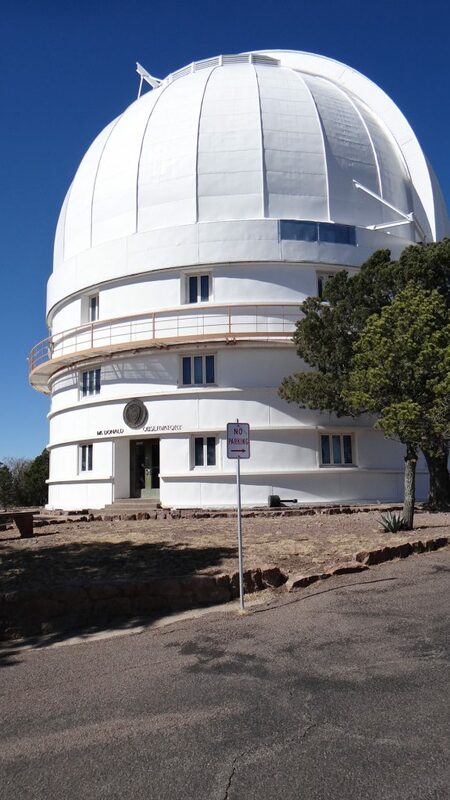 Hobby-Eberly Telescope houses a 10 metre mirror making it the 3rd largest in the world. 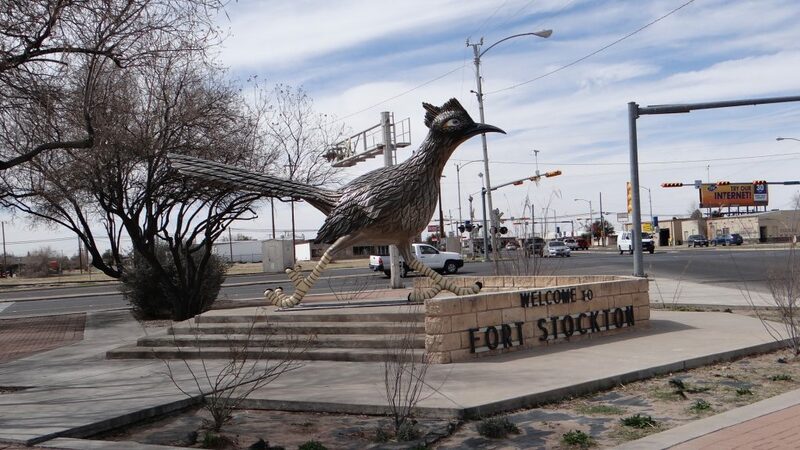 The next day we visited Fort Stockton which featured a driving tour round historic Fort Stockton. 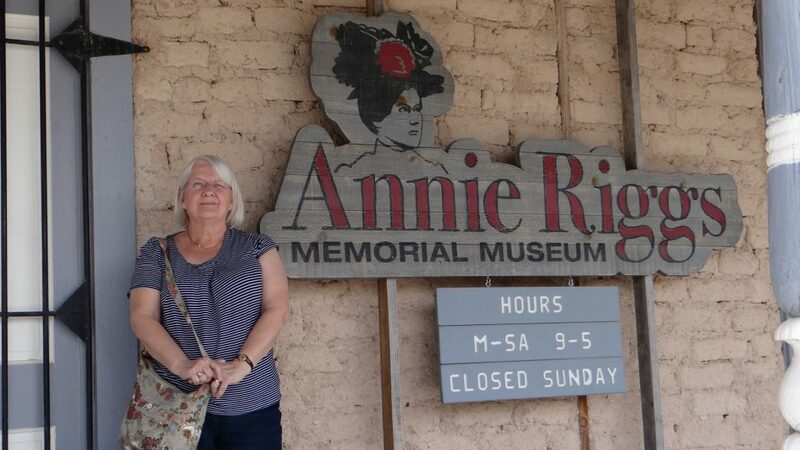 The tour was a bit of a let down with the most interesting bits being the Annie Riggs Memorial Museum that contained some interesting exhibits and a HUGE Roadrunner statue. 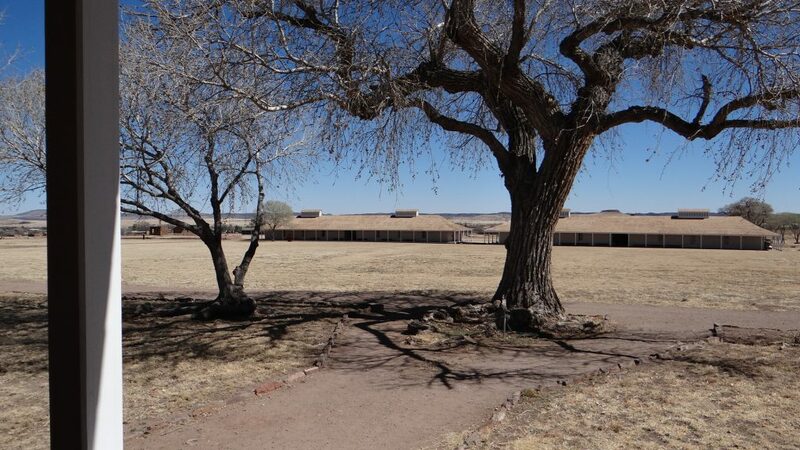 The Fort was very small with some rebuilt buildings and not a patch on Fort Davis. 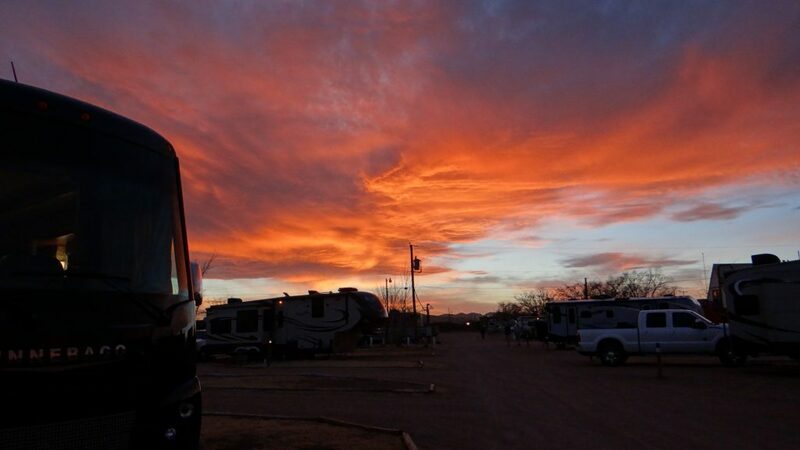 The following day we left Monahans Sandhills State Park and set of for El Paso via a very nice RV park At Van Horn where we saw a most impressive sunset. 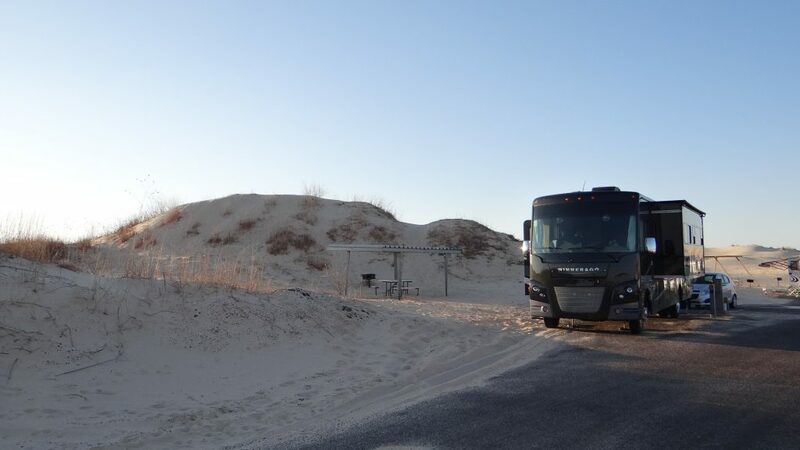 Morning amongst the sand dunes. 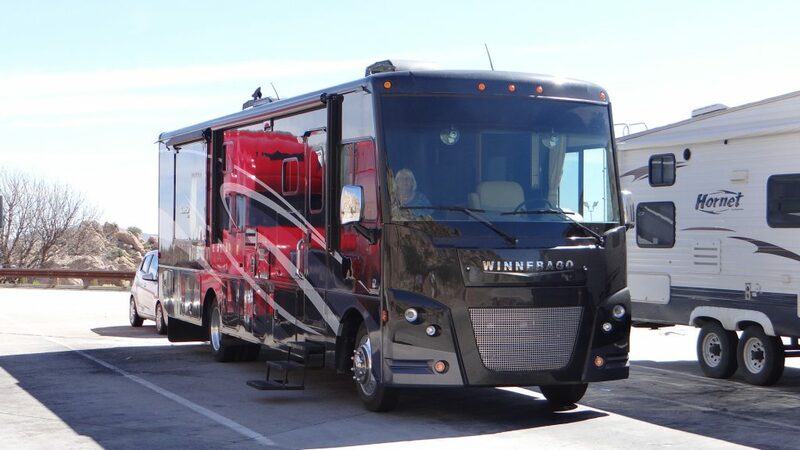 After a pancake breakfast in the RV parks Café we set off for El Paso, which is where I am writing this blog. 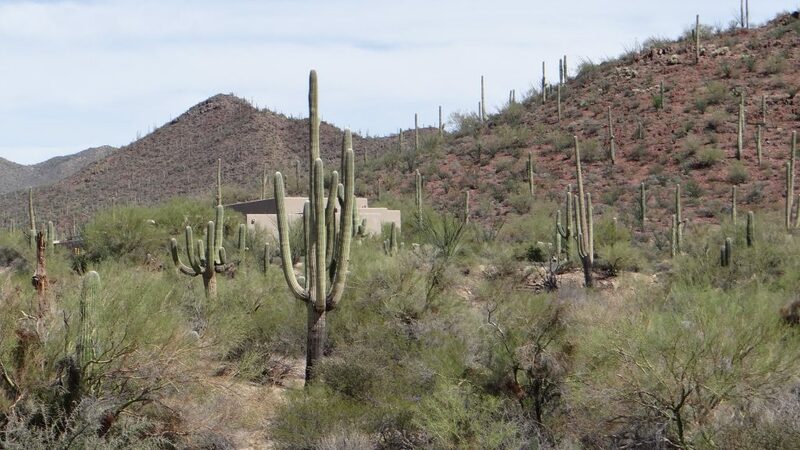 We are staying here 4 nights to see the sights, and then we move on to Tucson, but more of that in my next post.